It has been a few years since I’ve updated reviews of Symbiodinium (zooxanthellae) clades (a clade is a grouping that includes a common ancestor and all the descendants (living and extinct) of that ancestor) and their hosts. Here I’ll provide information on several newly described zooxanthellae species (S. boreum, S. psygophilum, S. thermophilum.) The latter is particularly interesting because of its surprising ability to rapidly (centuries) to adapt to increased ocean temperature. We’ll also examine heat tolerance of clade ‘C’ (often found in popular SPS corals) and environmental factors other than heat that could influence the symbiotic relationship, new information on ‘G’ clades, relationships of Hawaiian coral zooxanthellae, the database has been cleaned up (a tedious task when it now contains well over 2,000 entries) and so on. The listing of recognized Symbiodinium species has been expanded to 26, though there is some disagreement among researchers about the exact number that are ‘officially’ recognized. For example, the guru of zooxanthellae cladistics Todd LaJeunesse recently mentioned about 20, while AlgaeBase.org and WoRMS.org (World Registry of Marine Species) report different numbers. It’s going to take a while to get this sorted out, so, for now, Table One (below) will list 25 species. The number of clades also varies from source to source. The confusion might arise from the genetic fingerprinting method used to as it is not uncommon for the same clade possess two clade assignments. In any case, the number of clades listed here now exceeds 300, up considerable from previous articles. I must admit that motivation to work on this project results partially from a frustration with the longevity of false notion that ‘SPS’ (small-polyped stony corals) require more light intensity than soft corals. This is not true due to a number of factors, including the fact that most Acropora, Stylophora,Pocillopora and others contain zooxanthellae belonging to Clade C – these are less tolerant of high light than a few other clades. In addition, soft corals and Tridacna clams possess tissues much thicker than those of SPS corals which results in self-shading of those zooxanthellae living deeper in host tissues. 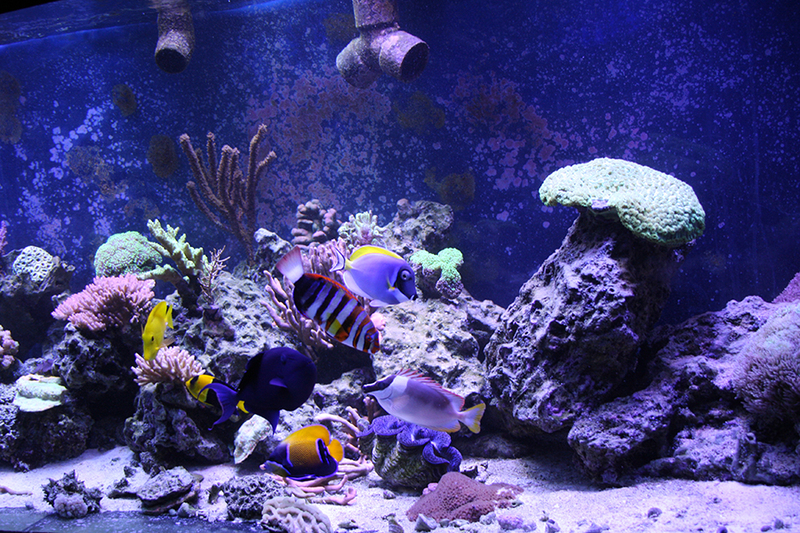 Perhaps it is ‘bright light’ is poorly defined and is a subjective term – an aquarium lighted by 18-watt T5 fluorescent lamps will appear ‘bright’ in a darkened door. Not that a naturally lighted room is necessarily bright – the living room in my house in Hawaii has large windows and sliding doors facing south and west with some illumination originating from the north and east. At noon, during the summer, the light intensity within this room is only 10 µmol photons·m²·sec (or 500 lux) – about 1/200th of sunlight’s maximum intensity, yet this room seems anything but dim. With that said, I learned long ago that it is not my lot in life to convince everyone of the veracity of statements presented in peer-reviewed literature, so I digress. This work is rather lengthy (almost 100 pages) hence an explanation on how to use it is in order. The database (well over 2,000 entries) lists coral hosts in alphabetical order. Also listed is the zooxanthella ‘type’ or clade, along with collection location, depth, and journal reference. For example, let’s say we are interested in the zooxanthella clade found in the stony coral Pocillopora ligulata. After finding the coral in the database, and we see that a P. ligulata collected in Hawaii contains zooxanthella clade C1g. Obviously there may be more information available (more than I could squeeze into the Excel spreadsheet) so the text portion of this article lists several hundred clades in alphabetical order. Finding C1g in the text, we see that C1g is thought to have descended from clade C1 and is possibly endemic to Hawaii, along with information about the clade’s depth range and other hosts. Our understanding of how corals, and more specifically their algal symbionts, react to environmental stressors continues to increase in dramatic fashion. Analyses of genetic coding of zooxanthellae (Symbiodinium species) using sophisticated scientific techniques allow insights of the degree of flexibility these dinoflagellates possess and how they exploit these adaptive capabilities. We now know there are ‘generalist’ zooxanthellae that can thrive in wide ranges of light fields and, to a lesser extent, temperatures. Other types (or clades) of Symbiodinium do best in relatively narrow ranges and are known as ‘specialists’. This fact goes a long way in explaining why, for instance, one species of Acropora will thrive in a given aquarium while another species in close proximity (and in practically the same environmental conditions) will not do well. In addition, some clades are more resistant to loss of zooxanthellae due to a number of environmental parameters. Figure 1. Photomicrograph of zooxanthellae within coral tissues. Polyps (at upper left and lower right) contain elevated numbers of Symbiodinium. This coral, a Pocillopora damicornis, was grown on a microscope slide allowing for light to be transmitted through the thin skeleton and tissues. Photo by the author. I decided to consolidate and update these two articles here. While these previous articles listed about 800 corals and their ‘type(s)’ of symbionts, the database presented here contains over 2,000 entries. Here, clades are examined individually, with geographical range, water depth, hosts, and additional information listed. The complete spreadsheet can be downloaded from here in PDF format. Why should anyone be interested in a rather obscure subject such as this? After all, we know that coral animals (hosts) and zooxanthellae (symbionts) generally have a mutually beneficial relationship. We realize zooxanthellae need light and either too much, or not enough, photosynthetically active radiation will cause problems for either the dinoflagellate or the host. In the most severe cases, the coral animal will eject its zooxanthellae in a process known as bleaching. Bleaching is generally exacerbated by higher than normal water temperature and ultraviolet radiation although Wijgerde et al. (2014) demonstrated that red light can affect the photophysiology of zooxanthellae found in the stony coral Stylophora pistillata (an effect originally demonstrated in Hawaiian corals by Kinzie in 1999.) Bleaching can also be caused by exposure to low temperature. New information may make us re-think the symbiosis between Symbiodinium and coral animals. Zooxanthellae contain specialized parts in order to maintain cell health, function, as well as photosynthesis. Figure 1 shows some of those parts, and definitions follow immediately. Figure 2. A few of the ‘parts’ or organelles making up a single zooxanthella cell. Not shown are many other components, such as Golgi apparatus, mitochondria, etc. Organelle: A specialized sub-portion of a cell. Chloroplast: The organelle where photosynthesis occurs. Thylakoidbodies (arranged in thin layers called lamellae) are coated with photopigments, including chlorophyll a, chlorophyll c2, peridinin, and others. The chlorophyll content is, of course, green; however, peridinin absorbs mostly blue and some green wavelengths, thus making the zooxanthella appear golden brown. Lysosome: Organelles that contain hydrolytic enzymes. Nucleus: An organelle essential to cell function, such as reproduction and protein synthesis. The nucleus is surrounded by a nuclear membrane. 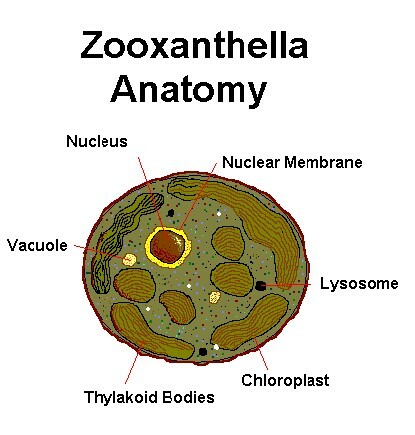 Vacuole: Small cavities within the cell containing liquid. Advances in DNA fingerprinting have allowed researchers to identify many life forms to species and subspecies level. A handful of dedicated scientists are devoting their careers to the investigation of various types of zooxanthellae, and are generating a great deal of data. We’ve known for some time that there isn’t just a single species of zooxanthellae (Symbiodinium microadriaticum) – there are at least 25 described species (Gomez, 2012) with many subspecies (variously called clades, types, or phylotypes). There are Clades A, B, C, D, E, F, G and H (see Figure 3). Of these, Clades A, B, C, D (and to a lesser degree F and G.) Symbiont populations tend to follow Fisher log-normal distribution patterns characterized by ‘generalist’ zooxanthellae (common) and rare zooxanthellae (‘specialists’) hosted by specific coral species (Pochon et al., 2001). For instance, some zooxanthellae clades are tolerant of high light intensity, while others have higher thermal tolerances, and this is where it begins to get interesting to hobbyists. Figure 3. A gene tree of zooxanthellae clades showing how different clades are related to each another. This is a synthesis of works performed by Cofforth and Santos (2005), and is based on ITS2 analyses. Note that clades A, B, C, D, E, F, and G have been found in corals. Table One. Symbiodinium Clades and Host, if applicable. S. minutum B1 Aiptasia sp. S. tridacnorum A* Tridacna sp. * World Registry of Marine Species references AlgaeBase.org as the source without further information. Each Clade contains sub-clades, and variations of sub-clades. 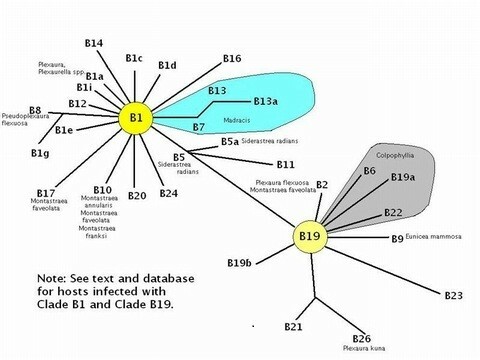 In the following database, zooxanthellae sub-clades are listed by an alpha-numeric designation, in some cases, a lower case letter for further refinement (i.e., C1a indicates Clade C, and the lower case letter indicates a variation of subclade 1). The following listing reports almost over 300 of them (up from about 150 in previous articles). Even with advances in DNA fingerprinting, there is a question of speciation. What genetic markers determine if a certain clade of zooxanthellae rises to the level of becoming a new species? Until integrated examinations are completed, these questions will remain unresolved (Takabayashi et al, 2004). This isn’t that much of an issue as far as hobbyists are concerned but it is causing constant revisions in the taxonomy of symbiotic dinoflagellates. ITS1, ITS2, lsu, etc. – What Do They Mean? Strands of DNA have ‘regions’ such as ITS1, ITS2 and many others (ITS stands for ‘internal transcribed spacer’.) Unfortunately, researchers have not standardized methods, or more specifically the part of the DNA examined (although one of the most prolific researcher – Todd LaJeunesse – has chosen the ITS2 region). Therefore, we should be careful when comparing results reported by various scientists since portions of DNA are more, or less, conserved than other parts. However, there is general – but not universal – agreement about zooxanthellae clades. Atlantic and Caribbean corals usually contain variations of Clade B (there are exceptions of course!) with A and C making up the difference, with Clade D only rarely seen. On the other hand, Pacific corals usually contain variations of Clade C (again with exceptions to the rule). It is believed that closure of the Central American seaway by the rise of the isthmus that is now Central America created distinct zones for coral growth and zooxanthellae specialization. The survival of Atlantic corals during glaciation of the northern hemisphere (the Ice Age thought to be caused by the previously mentioned isthmus that caused a drastic change in ocean currents) depended upon adaptation resulting in co-dominant zooxanthellae clades, while southern Pacific corals enjoyed mostly tropical environs during this period and C clades dominated. See Figure 4. Figure 4. Caribbean zooxanthellae population by clade. From LaJeunesse, 2003. Figure 5. Clades found on the Great Barrier Reef. As mentioned earlier, taxonomy of zooxanthellae is constantly revised, with elevation from clade level to species not particularly uncommon. In addition, there is confusion created by using cultures of zooxanthellae – Santos et al. (2001) report that zooxanthellae cultured in vitro may not be representative of the dominant in hospite zooxanthellae clade since conditions within the culture vessel may favor the growth of a sub-dominant clade. This is an important point to consider when reviewing early research works. However, this list is believed to be correct as of late 2016. As mentioned, we begin to see traits common among zooxanthellae clades. Two important traits are Xanthophyll Production and production of Mycosporine-like Amino Acids (MAAs). Again, assigning characteristics found in one species to all zooxanthellae found within a particular clade is risky business. However, trends do seem to develop upon close examination, at least in Clade A and Clade B. While xanthophylls protect zooxanthellae from visible light energy, mycosporine-like amino acids (MAAs) protect them from ultraviolet radiation. So named because these amino acids were first isolated from fungi, MAAs are produced by plants, fungi and some bacteria. The chemical pathway leading to MAA production (the shikimate pathway) is not known to occur in animals, so MAAs can be obtained from zooxanthellae known to produce them. MAAs can also be obtained through dietary means (ingestion of algae or animals containing accumulated MAAs). Interestingly, Shick et al. report that the temperate sea anemone Anthopleura elegantissima obtains certain MAAs from ocular lenses in fishes it ingests. It is possible that bacteria and/or cyanobacteria can translocate MAAs, or modify translocated or ingested MAAs. It is also possible that translocated MAAs could be modified by the host coral. In short, MAAs can be obtained from sources other than zooxanthellae. However, the ability to produce and release these important compounds to the coral host likely gives the coral a competitive edge in shallow environments. It is now believed that most, if not all, zooxanthellae clades produce MAAs upon exposure to sufficient amounts of visible or ultraviolet radiation. Table 2. A listing of Mycosporine-like amino acids (MAAs). These are naturally occurring sunscreens. All maximally absorb Ultraviolet B radiation. These might be manufactured by the zooxanthellae, or obtained by the coral host through feeding. Note that no MAAs’ absorption peak is remotely close to radiation peaks produced by lamps containing the element mercury (that is, fluorescent, power compact, mercury vapor, and metal halide lamps). A recent and very interesting paper (Banaszak et al., 2006) discusses the likelihood that many (if not all) zooxanthellae clades can produce natural sunscreens to protect themselves and their hosts from ultraviolet radiation. These researchers now believe that major clade groups (A, B, C, D and E) can produce these colorless, protective substances called mycosporine-like amino acids (MAAs). This contradicts previous beliefs based on research conducted with symbionts isolated from hosts and then cultured under relatively low light intensity (~70 µmole photons·m²·sec). It now seems that higher light intensities and/or ultraviolet radiation are needed in order for the zooxanthellae to make these pigments (the coral host cannot, since shikimate pathway is known to occur only in plants). Hence, should high-intensity lamps (such as metal halide and mercury vapor) not be shielded with a UV-absorbing lens? No – the results of Banaszak’s research only reinforces the notion that we should shield our aquarium inhabitants from potentially harmful UV radiation. For instance, a coral, grown in a dimly lighted portion of an aquarium, could be exposed to relatively intense UV radiation if it is moved only a few inches into a ‘brighter’ spot. These researchers also note the production of MAAs is an energetically expensive process (they quote a figure that 19% of a cell’s total energy budget is required for production of the MAA Palythine – energy that otherwise could be used for growth and reproduction). Protection from UV Radiation. A review of early literature would suggest that some zooxanthellae are not capable of producing mycosporine-like amino (MAAs) and are therefore subject to potential harm of ultraviolet radiation. Since then, the scientific opinion has shifted – all zooxanthellae clades tested were able to produce MAAs in response to relatively high amounts of UV (the zooxanthellae would often not produce MMAs in response to low UV doses). However, see the comments in the discussion section below as to why we should shield corals from UV. Protection from Intense Light. Some zooxanthellae are able to produce and incorporate xanthophylls to protect themselves from high light intensity. Not all do, and there are alternative protective pathways such as spillover or non-radiant heat dissipation once absorbed light energy enters the reaction center of Photosystem II (See Riddle, 2004b for details of high light intensity on captive corals). Some zooxanthellae apparently possess little, if any, means of coping with high light intensity. They will either do well in darker environments or merely survive in a hostile environment. Thylakoid Membrane Composition. Recent research suggests even more strategies to resist bleaching. Tchernov (2004) suggest the lipid saturation of the hydrophilic thylakoid membrane within the chloroplast determines resistance to compromise by exposure to increased temperature. In effect, the very composition of the light-collecting apparatus predetermines resistance to photodestruction and bleaching. Further, Diaz-Almeyda et al. (2011) determined the melting points of thylakoid membrane-bound lipids in Clades A1, A2, B1, C1 and F2. Hydrogen Peroxide Production. Suggett et al. (2008) found Symbiodinium clade B1 (not tolerant of high temperature) produced more hydrogen peroxide than clade A1 (less sensitive to higher temperature) when exposed to a temperature of 32°C (89.6°F). H2O2 is destructive to tissues and excessive amounts play a part in the bleaching process. Kahng and Maragos (2006) reported stony corals Leptoseris hawaiiensis and L. yabei flourishing at a depth of 120 meters (393 feet). Other reports list zooxanthellate corals surviving at depths of 165 meters (540 feet). A recent paper (Wagner et al., 2010) found black corals collected at depths of 396 meters (~1,300 feet). How do these zooxanthellae obtain their nutrition? Is it from the water column, or does the relationship become one of parasitism, where the dinoflagellate robs the animal of its resources? Perhaps we’ll have an answer as more research is conducted. It should be noted that the concept of parasitic zooxanthellae is not new – see Stat et al., 2008 for their comments. These researchers believe Clade A zooxanthellae (found in Hawaiian Acropora hyacinthus) could compete with co-occurring Clade C for resources from the coral, thus becoming parasitic to the animal. In another hypothesis, perhaps Clade A never fully achieved a mutualistic relationship with the coral. There is evidence that some clades become seasonally parasitic. Thornhill et al., 2008, found B2 may become photosynthetically inactive during adverse conditions, and may switch from mutualism to commensalism, or parasitism. While the idea that corals may adapt to changing environmental conditions by ‘shuffling’ zooxanthellae is an intriguing one, it seems to be the norm for the host to retain a specific symbiont. This has been found to be true for corals used in transplantation experiments: Fungia scutaria specimens retained their Pacific zooxanthella clade decades after transfer to the Caribbean; Hawaiian Porites compressa did the same when transferred from depth to the shallows. Scattered reports of adaptation by symbiont shuffling could perhaps be due to cryptic symbionts becoming dominant after an upset (as good as modern technology is, identification of zooxanthellae to clade level is not reliable when a sub-population levels falls below 5-10% of the total population). However, it has been established that dominance of a certain clade within a coral can be only temporal. For instance, young GBR Acropora tenuis specimens can contain Clades C1 and D. Clade D is dominant in younger corals and when populations shift to C1, the corals grow more quickly, suggesting the algal/host association can sometimes come at some cost (Abrego et al., 2008). Venn et al. (2008) found shifts in cladal populations of Symbiodinium hosted by the anemone Condylactis gigantea to adjust to seasonal variations in temperature. In near shore environments subject to thermal variations, Clade A was predominant, while those anemones in more thermally stable environments hosted mostly Clade B. In addition, Clade A was most prevalent during periods of warm water temperature (26.5°C). During the winter, when water temps dropped to 18.5° C (65.3°F), the major population shifted to mostly Clade B. These researchers also found Clade B bleached at 32°C (89.6°F), while Clade A did not. Unfortunately, there is not a universally recognized protocol for identifying different zooxanthellae clades. Generally, however, a clade is identified by an alphanumeric tag – a primary capitalized alphabetical symbol (A, B, C, etc.) followed by a numerical ID, sometimes a lower case letter and, rarely, a second lower case letter (as in C3ha). Not all researchers have followed this code and have labeled newly discovered strains by a capitalized letter and a symbol unique to that clade (e.g., C+, C·). It seems certain that most works use the former method of classification, and that the latter identification symbols will eventually conform to a widely-accepted standard. Clade “A” zooxanthellae are generally considered relatively hardy (resistant to a number of environmental shifts), and are found in scleractinian corals, octocorals, hydrocorals, clams, anemones and zoanthids. Most hosts of Clade “A” zooxanthellae are found in the Caribbean, with sporadic reports of occurrences in Australia’s Great Barrier Reef, Hawaii, the Red Sea and the western Pacific (Korea). Clade A is considered ancestral to all other Symbiodinium lineages. Figure 6. A phylogenic tree demonstrating relationships among zooxanthellae clades, along with host information. After LaJeunesse et al., 2009. Interestingly, Stat et al. (2008) found that Acropora hyacinthus specimens containing Clade A were more susceptible to disease than those harboring Clade C zooxanthellae. These researchers found Clade A to fix and release only a fraction of carbon compared to Clade C. If Clade A produces only a small percentage of carbon compounds, then its very existence within the host is in danger, especially when conditions are sub-optimal. On the other hand, Stat mentions that an anemone (Condylactis gigantea) containing Clade A zooxanthellae did not suffer from any ill effects from the symbiosis. Figure 7. Symbiodinium Clades found in the Caribbean. Figure 8. Symbiodinium Clades found on the Great Barrier Reef. Many (often early) researchers listed cladal types simply as “A”, “B”, “C”, etc. Acropora sp., Acropora cervicornis, Acropora formosa, Acropora hyacinthus, Acropora longicyathus, Acropora palmata, Aiptasia pallida, Anthopleura kurogane, Condylactis gigantea, Dendrophyllia, Diploria labyrinthiformis, Favia fragum, Galaxea fascicularis, Gorgonia ventalina, Hippopus hippopus, Hippopus porcellanus, Litophyton arboretum, Meandrina meandrites, Millepora sp., Montastrea annularis, Montastrea faveolata, Montastrea franksii, Montipora capitata, Nephthea sp., Plexaura homomalla, Porites astreoides (brown), Porites astreoides (green), Porites colonensis, Porites furcata, Porites nigrescens, Sarcophyton glaucum, Stephanocoenia intersepta, Stephanocoenia michellini, and Stereonephthyacundabiluensis. Clade A1. Symbiodinium microadriaticum subspecies microadriaticum. Host Species: Found within tissues of the anemone Anemonia viridis (strain Avir), the jellyfish Cassiopeia and some corals, including Cassiopeia xamachana, C. andromedaand C. frondosa, Red Sea stony coral Stylophora pistillata (LaJeunesse, 2001) and Acropora cytherea, Acropora longicyathus, Acropora valida, (LaJeunesse, 2001, 2002; Visram and Douglas, 2006), Pocillopora verrucosa, and the jellyfishCotilorhiza. This zooxanthella species acclimates to high and low light levels. Protective xanthophylls are produced in super-saturating light intensities (this light intensity = 250 µmol·m²·sec; Iglesias-Prieto and Trench, 1997.) A1 is known to produce to produce at least two mycosporine-like amino acids (mycosporine-glycine and shinorine, Banaszak et al., 2006) even in the absence of ultraviolet radiation. This clade is considered thermally tolerant (26ºC – 78.8ºF – was the experimental temperature) by Hennige et al., 2006. Robinson and Warner (2006) also report Clade A1 is tolerant of temperature as high as 32ºC (89.6ºF), but demonstrated a reduction in photosynthetic activity as well as growth (possibly due to resources being devoted to repair of zooxanthellae photosystem(s)). Note: Roberty et al. (2015) exposed zooxanthellae from Anemonia viridis to a temperature of 33°C and high light (1,000-1,500 µmol photons·m²·sec) and found its photoprotective functions were overwhelmed. Under lower light intensity, Clade A1 apparently has a capacity to ‘process’ absorbed light energy (photons), thus preventing a ‘traffic jam’ of electrons between zooxanthellae Photosystems I and II, thus preventing chronic Photoinhibition (Hennige et al., 2006). In addition, Clade A1 does not produce increased amounts of hydrogen peroxide (as Clade B1 does) when exposed to elevated temperature of 32°C (89.6°F; Suggett et al., 2008). Reference: Originally described in Freudenthal, 1962. Note: Listed in the Encyclopedia of Life (eol.org) as a Symbiodinium species. Reference: LaJeunesse et al., 2008. Host Species: Zoanthus sociatus, stony coral Meandrina meandrites, the photosynthetic clam Corculorum cardissa, Gorgonia ventalina, Bartholomea annulata, a Pacific hydrocoral Heliopora, and the ‘giant clam’ Tridacna gigas. Symbiodinium pilosum. Found in the Caribbean zoanthid Zoanthus sociatus. These are high light adapted (they respond poorly to low light levels), tolerate high temperatures swings and are able to produce and incorporate protective xanthophylls (diadinoxanthin and diatoxanthin) into chlorophyll protein complexes. 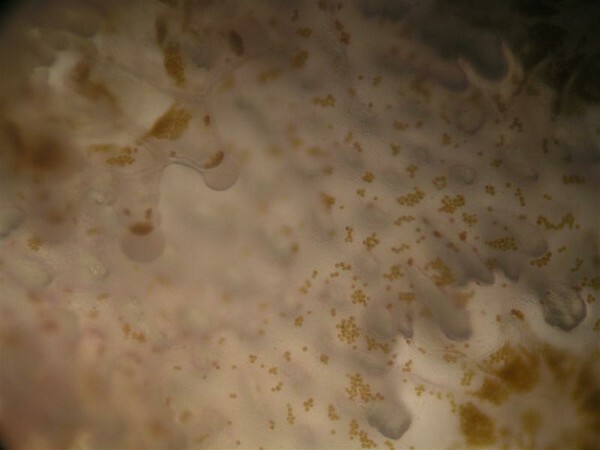 Iglesias-Prieto and Trench, 1997, found this zooxanthella to be the least adaptive in respect to light intensity of 6 zooxanthellae examined (high light is tolerated while low light intensity is not). Symbiodinium meandrinae. This zooxanthella was discovered within the tissues of the Atlantic stony coral Meandrina meandrites. It is now considered Clade A2 (LaJeunesse, 2001). Symbiodinium meandrinae. This zooxanthella was discovered within the tissues of the Atlantic stony coral Meandrina meandrites. Banaszak et al., 2000, found two zooxanthellae clades (A and C) within M. meandrites, Baker and Rowan (1997) report Clade B. This leads to confusion over the actual identity of S. meandrinae Trench (1997) clarifies the situation by listing S. meandrinae as Clade A. Host Species: Known hosts include the jellyfish Cassiopeia mertensii from Hawaii (LaJeunesse, 2001; LaJeunesse et al., 2004), a Tridacna clam (species unreported, Baille et al., 2000), Tridacna crocea, T. maxima, T. derasa, T. gigas, and another ‘giant clam’ (Hippopus hippopus; LaJeunesse, 2001), Montastrea faveolata (Belize, across a depth range of 2 to 8m), a Belizean stony coral (Siderastrea intersepta, @ 8-15m; Warner et al., 2006), the anemone Condylactisgigantea, stony corals Acropora palmata, shallow-water Acropora cervicornis,Porites spp., and Stephanocoenia michelini. Comments: Tolerant of higher light levels (Hennige et al., 2006). A3 zooxanthellae are known to produce 1 ultraviolet-absorbing compound – the MAA mycosporine-glycine (Banaszak et al., 2006). Thornhill et al., 2008, found A3 zooxanthellae lowered their chlorophyll content when exposed to very low temperature (10.5°C – 50.9°F), and did not recover within 3 weeks of exposure (the end of the experimental period). Reference: Warner et al., 2006. Host Species: Thimble jellyfish (Linuche unguiculata). A4 is also found in the Caribbean sea whip Plexaura homomalla (LaJeunesse, 2001), Porites astreoides corals from Belize (depth of 2-8m; Warner et al., 2006) and the anemone Condylactis (LaJeunesse, 2002). Comments: Clade A4 is also called Symbiodinium (=Gymnodinium) linucheae. Host Species: Porites astreoides, Belize 8-15m (Warner et al., 2006), the ‘fire coral’ Milleporaalcicornis, anemones Condylactis gigantea and Stichodactyla helianthus (LaJeunesse, 2002). References: Tridacna squamosa (LaJeunesse, 2001); Pacific ‘soft coral’ Capnella (van Oppen et al., 2005). A13 or A1a: Symbiodinium microadriaticum subspecies condylactis. Host Species: Jamaican Cassiopeia frondosa and, not surprisingly, Condylactis gigantea specimens. Also isolated from a Caribbean Porites astreoides (LaJeunesse, 2005) and Montastrea annularis. Comments: Thermally sensitive. Hennige et al., 2006 report this clade was stressed by higher temperature (26ºC – 78.8ºF (!) – was the experimental temperature). Robinson and Warner (2006) also report this clade is sensitive to temperature (experiment condition was 32ºC or 89.6ºF), which is exacerbated in ‘high’ light conditions. Clade A13 is also called Symbiodinium cariborum (LaJeunesse, 2001), as well as A1.1. Apparently, the confusion arises from results using different analytical techniques. *Comment: The numerical portion (188) of the clade ID is based on the length (bp) of a variable region in the chloroplast 23S rDNA gene, and not the ITS1 or ITS2 regions used by many researchers. Reference: Coffroth et al., 2010. *Comment: The numerical portion (194) of the clade ID is based on the length (bp) of a variable region in the chloroplast 23S rDNA gene, and not the ITS1 or ITS2 regions used by many researchers. Summary: Generally, Clade A zooxanthellae seem tolerant of high light intensity, and likely produce protective xanthophylls (for protection from predominantly ‘blue’ light) and mycosporine-like amino acids (that can absorb ultraviolet energy). Its existence is sometimes correlated with shallow back reefs. The number of hosts containing Clade A zooxanthellae populations are noted to decrease with increasing depth. Some have speculated that Clade A has never achieved full mutualism with its host or, under some stressful circumstances, could become parasitic. As with Clade “A” zooxanthellae, those of Clade “B” are relatively resistant to bleaching episodes. Current information suggests this clade is most common in Caribbean gorgonians (sea fans, sea whips, etc.). A subclade (B1) has been found in Hawaiian Aiptasia anemones and the stony coral Pocillopora damicornis (probably as a cryptic symbiont – Santos et al., 2004). 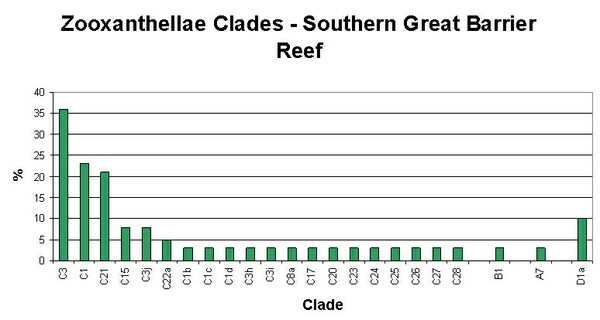 There are scattered reports of Clade B from Acropora species on the Great Barrier Reef (Crabbe and Carlin, 2009). Acropora hyacinthus, Aiptasia pallida, Aiptasia pulchella, Astrangia danae, Briareum asbestinium, Calpophyllia natans, Cladocora arbuscula, Dendrogyra cylindrus, Dichocoenia stokesii, Diploria clivosa, Diploria labyrinthiformis, Diploria strigosa, Eunicea aspercula, Eunicea calyculata, Eunicea colombiensis, Eunicea laciniata, Eunicea mammosa, Eunicea pallida, Eunicea species ‘1’ and ‘2’, Eunicea succinea, Eunicea tayrona, Eunicea tourneforti, Eusmilia fastigata, Favia fragum, Gorgonia sp., Gorgonia flabellum, Gorgonia mariae, Gorgonia ventalina, Isophyllastrea rigida, Madracis decactis, Madracis formosa, Madracis mirabilis, Madracis pharensis, Madracis senaria, Manicina aerolata, Meandrina meandrites, Montastrea curta, Montastrea faveolata, Montastrea franksii, Muricea muricata, Muriceopsis flavida, Muriceopsis sp., Muriceopsis urabensis, Plesiastrea verispora, Plexaura flexuosa, Plexaura homomalla, Plexaura kuna, Plexaurella nutans, Porites asteroides, Porites furcata, Porites radians, Pseudoplexaura flagellosa, Pseudoplexaura porosa, Pseudoplexaura sp., Pseudoplexaura wagenarii, Pseudopterogorgia americana, Pseudopterogorgia bipinnata, Pseudopterogorgia elisabethae, Pterogorgia anceps, and Pterogorgia citrina. Figure 9. Relative abundance of B clades found within Caribbean corals. Figure 10. Relative abundance of B clades found within corals of Australia’s Great Barrier Reef. Figure 11. Phylogenetic radiations of Clade B symbionts from progenitor Clades B1 and B19. These are mostly from the Caribbean, although ‘B’ clades are not particularly uncommon in some Pacific invertebrates (After LaJeunesse, 2005, with additional information from Thornhill et al., 2005). As with Clade ‘A’ zooxanthellae, those of Clade B are relatively resistant to bleaching episodes. Current information suggests this clade is most common in Caribbean octocorals (sea fans, sea whips, etc. ), but also present in many (a dozen or more) Atlantic stony coral genera. 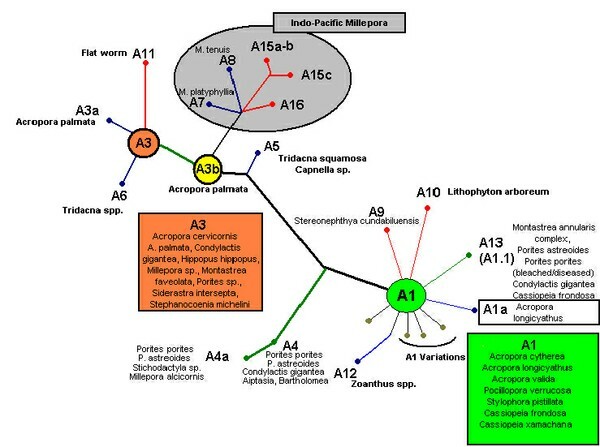 A subclade (B1) has been found in Hawaiian Aiptasia anemones and stony coral Pocillopora damicornis (probably as a cryptic symbiont Santos et al., 2004). Symbiodinium californium. This species does not produce mycosporine-like amino acids in culture (in Shick et al., 2002), but other evidence suggests S. californium can perhaps do so under conditions of high light and/or UV intensities. It is found within the Anthopleura elegantissima anemone. S. californium is sometimes listed as Clade “E” (Santos et al., 2001). S. californium is intolerant of colder water hence its distribution is in warmer waters (such as the southern California coast where temperatures are in the range of ~14.5-19°C, or 58.1-66.2°F). Secord and Muller-Parker (2005) found that S. californium is tolerant of high light intensity (PAR, or Photosynthetically Active Radiation) and photosynthetic saturation was not achieved at 540 µmol photons·m²·sec. The compensation point for these algae was about 73 µmol photons·m²·sec. Symbiodinium muscatinei. Also called Clade B4. This species has been described as found in tissues of the temperate anemone Anthopleura elegantissima. It is thought that this species does not produce ‘UV sunscreens’ (mycosporine-like amino acids, Shick et al., 2002), but instead acquires them through diet. S. muscatinei is sometimes listed as Clade “E.” (Santos et al., 2001). Secord and Muller-Parker (2005) found that S. muscatinei and S. californium are tolerant of high light intensity (PAR, or Photosynthetically Active Radiation) and photosynthetic saturation was not achieved at 540 µmol photons·m²·sec. The compensation point for these algae was about 73 µmoll photons·m²·sec. Symbiodinium muscatinei is found in cooler waters, generally along the Pacific Northwest coastline where water temperatures are within the range of ~8-15°C or 46.4-59°F. Symbiodinium pulchrorum. Found in the Hawaiian anemone Aiptasia. Iglesias-Prieto and Trench (1997) report S. pulchrorum has a high photoacclimatory capability (their experiment used 40 µmol·m²·sec as the sub-saturating intensity, and 250 µmol·m²·sec as the super-saturating light intensity). Banaszak (2000) did not find this species to synthesize MAAs, although subsequent research found the level of ultraviolet radiation was insufficient for MAA production (Banaszak, 2006). As a footnote to these observations, I have noticed that Aiptasia anemones do not fare well under high light intensity in outdoor tanks exposed to natural sunlight – they retract into small blobs, probably in an effort to self-shade their zooxanthellae from high PPFD (600 µmol·m²·sec and higher) and/or UV radiation. Summary for Clade B zooxanthellae species: Synthesis of UV protectants (mycosporine-like amino acids) seems dependent upon environmental conditions (though this is open to debate.) Clade B also seems relatively tolerant of higher light intensities. Host Species: Common to many Caribbean invertebrates, including the aquarium pest anemone Aiptasia (from Hawaii, LaJeunesse, 2001), soft coral Capnella (Wicks et al., 2010b), the sea fan Gorgonia ventalina (Kirk et al., 2005), Oculina diffusa (western Atlantic, LaJeunesse, 2001), Caribbean stony coral Diploria clivosa (Banaszak et al., 2006), Diploria strigosa, Favia fragum, the ‘rose’ coral Manicina areolata, Montastrea annularis (LaJeunesse, 2002), the stony coral Pocillopora damicornis in Hawaii, Pocillopora spp. in the Gulf of California, and others, including Pseudopterogorgia bipinnata and various ‘pesky’ anemones (Caribbean Aiptasia spp.). Clade B1 is equivalent to clade ‘B184’ (based on analysis of the 23S-rDNA; Kirk et al., 2005). B1 is an opportunistic clade, possessing characteristics allowing it to thrive after periods of environment disturbance (such as coral bleaching due to low water temperatures; LaJeunesse et al., 2010). Host Species: Plexaura homomalla and Plexaurella nutans. Comments: Closely related to clade B1. LaJeunesse, 2004. Comments: LaJeunesse et al., 2009. Reported Geographical Range: Caribbean, US eastern seaboard (Georgia coast northward to Rhode Island, USA) and US Gulf coast (roughly Tampa, Florida westward to extreme southern Texas coast). Host Species: Plexaura flexuosa, and stony corals Astrangia poculata, Montastraeafaveolata, Oculina arbuscula, and Oculina diffusa. Comments: Descended from Clade B19. LaJeunesse, 2004. Considered to be tolerant of low light and low temperature and recovers quickly after exposure to temperatures as low as 10.5°C (50.9°F; Thornhill et al., 2008). Host Species: Caribbean ‘jellyfish’ Dichotoma. Comments: B4 is Symbiodinium muscatinei, reportedly found in only temperate/cold waters. (LaJeunesse, 2001). Comments: A specialist zooxanthellae found only in the Caribbean coral Siderastrea radians (LaJeunesse, 2004). Comments: Specialist zooxanthellae clade found only in Siderastrea (Thornhill et al., 2006). Host Species: Colpophyllianatans from the western Caribbean. Comments: Descended from Clade B19. (LaJeunesse, 2004). Comments: Closely related to clade B1 (LaJeunesse, 2004). Host Species: The stony coral Colpophyllianatans and gorgonian Eunicea mammosa. Comments: Descended from Clade B19 (LaJeunesse, 2004). Comments: A specialist zooxanthella clade from Caribbean corals Montastrea annularis, M.faveolata and M. franksi (Thornhill et al., 2005). Closely related to clade B1 (LaJeunesse, 2004). Comments: Closely related to clade B1. (LaJeunesse, 2004). Comments: A specialist clade (LaJeunesse, 2004). Comments: B19 is believed to be an ancestor to many ‘B’ Clades. It has been isolated from a newly settled polyp of the Caribbean ‘soft coral’ Briareum, LaJeunesse, 2005. Comments: Descended from Clade B19. LaJeunesse, 2004. Comments: Closely related to clade B19. LaJeunesse, 2004. Comments: Closely related to clade B1- LaJeunesse, 2004. Comments: Isolated from a newly settled polyp of the ‘soft coral’ Briareum (LaJeunesse, 2005). Note: Descended from Clade B19 (LaJeunesse, 2004). Comment: The numerical portion of the clade ID is based on the length (bp) of a variable region in the chloroplast 23S rDNA gene, and not the ITS1 or ITS2 regions used by many researchers. This clade is tolerant of temperatures of at least 26°C (78.8°C). 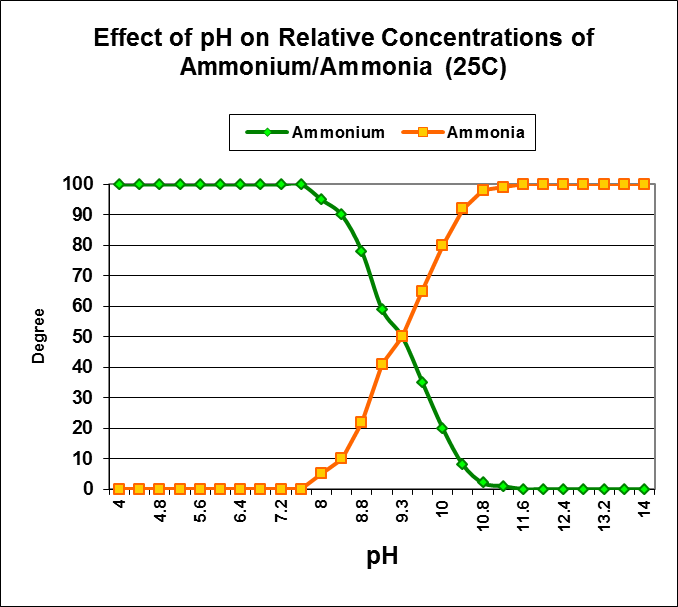 Experimental temperature of 33°C (91.4°F) was used to bleach P. divaricata of its symbionts. Comment: The numerical portion of the clade ID is based on the length (bp) of a variable region in the chloroplast 23S rDNA gene, and not the ITS1 or ITS2 regions used by many researchers. Clade C, as a group, is difficult to characterize, though Atlantic Clade C zooxanthellae are found in deeper water, while bleaching is often noted in Pacific corals containing Clade C symbionts. Generally, most Clade C zooxanthellae/corals inhabit tropical latitudes. Some Clade Cs are thermally-tolerant (C15), others are generalists exhibiting habitation over a broad range of depths (C1, C3 and C21), C8a is found only in deeper waters, C7c is limited to relatively shallow depths and in nature tolerates light intensity up to about 700 µmol·m²·sec. It is easy to see why Tchernov et al., 2004 warn of assuming closely related sister subclades will demonstrate similar traits (light and/or temperature tolerances for example). Acropora sp., Acropora aspera, Acropora cervicornis, Acropora cuneata, Acropora divaricata, Acropora gemmifera, Acropora glauca, Acropora latistella, Acropora longicyathus, Acropora millepora, Acropora spathulata, Acropora tenuis, Agaricia agaricities, Agaricia danae, Agaricia fragilis, Agaricia humilis, Agaricia lamarcki, Agaricia tenufolia, Alertigorgia orientalis, Alveopora japonica, Anthelia glauca, Briareum asbestinium, Briareum violacea, Cespitularia sp., Cespitularia pachyclados, Cespitularia tuberculoides, Colpophyllia natans, Cyphastrea ocellina, Diploria clivosa, Diploria labyrinthiformis, Diploria strigosa, Entacmaea quadricolor, Erythropodium caribaeorum, Eusmilia fastigata, Favia fragum, Favia matthai, Fungia paumotensis, Fungia scutaria, Gardineroseris planulata, Helipora coerulea, Heteroxenia fuscenscens, Hippopus hippopus, Isophyllastrea rigida, Isophyllia sinuosa, Klyxum sp., Lemnalia, Leptastrea transversa, Leptoseris cucullata, Lobophyllia sp., Lobophytum (described as species 1 and 2), Manicina aerolata, Montastrea annularis, Montastrea cavernosa, Montastrea faveolata, Montastrea franksii, Montipora patula, Montipora verrucosa/capitata, Mycetophyllia danae, Mycetophyllia ferox, Mycetophyllia lamarckiana, Oulophyllia crispa, Pachyseris speciosa, Pachyseris superficialis, Paralemnalia eburnea, Paralemnalia (described as species # 1 and 2), Paralemnalia thyrsoides, Parasicyonis, Pavona cactus, Pavona clavus, Pavona divaricate, Pavona duerdeni, Pavona gigantea, Pavona varians, Plexaurella dichotoma, Plexaura grisea, Plexaura nutans, Plumigorgia schoboti, Pocillopora damicornis, Pocillopora elegans, Pocillopora euydouxi, Pocillopora verrucosa, Porites astreoides (brown and green variants), Porites colonensis, Porites compressa, Porites cylindrica, Porites divaricata, Porites furcate, Porites lobata, Porites panamensis, Porites porites, Porites rus, Psammocora stellata, Psammocora superficialis, Rhytisma fulvum, Rhytisma (described as species #1 and #2), Sarcophyton glaucum, Sarcophyton trocheliophorum, Sarcophyton (described as species #1 and #2), Scolymia cubensis, Seriatopora hystrix, Siderastrea siderea, Siderastrea stellata, Sinularia sp., Sinularia gardineri, Sinularia leptoclados, Sinularia polydactyla, Sinularia querciformis, Sinularia (described as species #1 and #2), Stephanocoenia intersepta, Stephanocoenia michelinii, Tubipora musica, Xenia (described as species #1 and #2), Xenia farauensis, Xenia microspiculata, Xenia umbellata, and “Xenidae“. As Figure 12 demonstrates, those corals containing Clade C are dominant on Australia’s Great Barrier Reef. Figure 12. ‘C’ clades found in corals of Australia’s southern Great Barrier Reef. Figure 13. ‘C’ clades found within Caribbean corals. Figure 14. Adaptive radiations of Pacific zooxanthellae from an ‘ancestral core’ consisting of Clades C1, C3, C21 and C1c. (After LaJeunesse, 2005 – see that work for more information than this diagram illustrates). Figure 15. The same diagram as in Figure 14, but with added information. Note that some zooxanthellae clades are found predominantly in some coral genera (colored areas). Figure 16. Hawaiian zooxanthellae clades and hosts. Note that some of these clades have been seen only in Hawai’ian waters. Others are widely distributed but relegated usually to certain coral genera (such as 15b in Porites spp., soft coral Sarcothelia and deep-water ‘black corals’; 15c are currently described from Porites, and C1c, C1d and C1g in Pocillopora specimens). See Figure 10 for further info. Figure 17. Relationship of zooxanthellae clades found in corals from the Northwestern Islands of Hawaii. Clades found within colored bubble plots share an 97% identity. M. stellata, M. turtlensis, M. undata, and M. verrucosa (van Oppen et al., 2004). This clade is presently known to be distributed from Indonesia southward to the Great Barrier Reef. One has to wonder if this clade has high-fidelity to Montipora spp. and is one of those listed in LaJeunesse’s more-or-less concurrent paper (namely Clades C17, C26a, C27, C30, C31, C31a, C31b, C32, C58 and C73). van Oppen’s IDs are based on ITS1 sequences (while LaJeunesse’s – and many others’- are based on ITS2). Comments: Based on an ITS 1 sequences (most are based on ITS 2) – van Oppen 2004. Comments: A positive correlation has been established between this clade/coral and high sedimentation rates (Gareen et al., 2006). Comments: Apparently different from Thornhill’s Cpav (above), as these researchers (Oliver and Palumbi, 2011) analyzed chloroplast 23 s rDNA. Comments: Found in a S. pistillata colony also containing clades C35 and C35a. This coral colony experienced severe bleaching when water temperature reached 28.1°C (82.6°C). C1unk differs from C1b by only 1 bp (base pair – a ‘rung’ of the DNA ladder). Sampayo et al., 2008. Symbiodinium goreaui. Originally found within Ragactis lucida (in Trench, 1996) and expanded by LaJeunesse et al., 2003 to the pandemic generalist zooxanthellae Clade C1. Host Species: Acropora abrolhosensis, A. cervicornis, A. cuneata, A. divaricata, A. donei, A. humilis, A. hyacinthus, A. longicyathus, A. millepora, A. nobilis, A. palifera, A. sarmentosa, A. secale, A. tenuis, A. verweyi, Alveopora fenestrate, Astreopora sp., Astreopora myriophthalma, Bartholomea sp., Bartholomea annulata, Caulastrea chalcidicum, Condylactis, ‘Corallimorpharia’, Coscinarea sp., Coscinarea columna, C. wellsi, Cycloseris vaughani, Cyphastrea sp., Cyphastrea chalcidicum, C. decadia, C. japonica, C. microphthalma, C. serailia, Discosoma sp., D. carlgreni, D. sanctithomae, Echinophyllia, E. echinoporoides, E. orpheensis, E. lamellosa, Eunicea, Euphyllia sp., E. ancora, E. divisa, E. glabrescens, Favia sp., F. favus, F. pallida, F. speciosa, Favites abdita, Fungia sp., F. crassa, F. echinata, F. fungites, F. granulosa, F. scutaria, Galaxea sp., Galaxea astreata, Goniastrea sp., Goniastrea australensis, G. favulus, G. pectinata, G. rectiformis, Goniopora sp., G. columna, G. djiboutiensis, G. lobata, G. minor, G. tenuidens, Heliopora coerulea, Herpolitha sp., H. weberi, Hydnophora sp., H. exesa, H. rigida, Icilogorgia, Lebrunia sp., Lebrunia danae, Leptastrea sp., Leptastrea incrustans, L. pruinosa, L. purpurea, L. phrygia, Leptoseris incrustans, L. yabei, Linuche sp., L. unguiculata, Lithophyllon undulatum, Lobophytum sp., Merulina sp., Merulina ampliata, M. scrabicula, Millepora sp., Millepora exaesa, Montastrea curta, M. valenciennesi, Montipora sp., Montipora aequituberculata, M. cactus, M. confuse, M. digitata, M. efflorescens, M. hispida, M. spongodes, M. undata, Mycedium sp., Mycedium elephantotus, Pachyseris sp., Pachyseris rugosa, Palauastrea sp., Palauastrea ramosa, Palythoa sp., Palythoa caribaeorum, Pavona desucata, P. duerdeni, P. frondifera, P. varians, Pavona venosa, Plerogyra sp., Plerogyra sinuosa, Plesiastrea verispora, Plexaura, Plumigorgia sp., Pocillopora damicornis, Polyphyllia sp., Polyphyllia talpina, Porites sp., P. cylindrica, P. divaricata, P. lutea, P. solida, Psammocora sp., P. contigua, P. digitata, P. profundacella, Pseudosiderastrea tayamai, Pteraeolidia, Rhodactis sp., Rhodactis (Heteractis) lucida, Rhystima sp., Rumphella sp., Sarcophyton sp., Scolymia sp., Scolymia australis, Siderastrea sp., Siderastrea siderea, Sinularia sp., Stylocoeniella guentheri, Stylophora sp., Stylophora pistillata, Tridacna sp., Tridacna derasa, T. gigas, T. maxima, Turbinaria sp., Turbinaria frondens, Turbinaria mesenteria, T. stellulata, and Zoanthus sp.. Comments: It is thought that thermally sensitive clades (such as B1, C1, and E) rely on the Mehler Reactions more than the thermally tolerant clade F1. Roberty et al., 2015.) In other words, enzymes destroying oxygen radicals and hydrogen peroxide prevent cellular damage. If these enzymes are overwhelmed, great harm to zooxanthellae and the host could result. Host Species: Briareum, Lemnalia, Paralemnalia spp. Host Species: Fungia scutaria, Porites asteroides, and Porites colonensis. Comments: Believed to have evolved from Clade C1. LaJeunesse, 2005. A Fungia scutaria transplanted from the Pacific to Jamaica by pioneer researcher Thomas Goreau was found to have retained Clade C1a decades after the transfer. Although valuable information was obtained from these transferred corals, some scientists considered the Fungia specimens to be invasive, and a search-and-destroy mission eliminated (or greatly reduced) their population. Host Species: Leptastrea sp., Leptastrea purpurea, Pavona sp., Pavona superficialis, Pavona varians, Tubipora sp. and Tubipora musica. Comments: Believed to have evolved from Clade C1. LaJeunesse, 2005. Comments: Believed to have evolved from Clade C1. Thermally sensitive to low water temperatures. LaJeunesse et al., 2003; 2010. Host Species: Acropora cuneata, Pocillopora ligulata, Pocillopora meandrina, Pocillopora damicornis, Pocillopora eydouxi, a Pocillopora hybrid, Pocillopora verrucosa, Pavona sp., Pavona gigantean and the soft coral Sinularia. Comments: Clade C1c (along with C1, C3, C21, C3d, and C45) is believed to be an ancestral type from which other clades evolved (LaJeunesse, 2005). Found in Pocillopora specimens from the western, central and south Pacific (Okinawa and GBR), a Pavona specimen and an unidentified soft coral from the eastern Pacific. PAM fluorometry work found onset of photosaturation at 275 µmol photons·m²·sec (~5,500 lux) and onset of photoinhibition at ~425 µmol photons·m²·sec (~21,250 lux) in a shallow-water Hawaiian Pocillopora meandrina specimen (ITS 2 analysis by Smith et al., 2009; PAM fluorometry by Riddle, 2007: http://www.advancedaquarist.com/2007/3/aafeature1/ Ulstrap et al., 2006 report a Pocillopora damicornis specimen possibly containing C1c (or C1j, a subclade of C1) showing photoinactivation (a decrease in photosynthetic activity) at lower irradiance levels in shaded portions of the colony than in those parts exposed to direct light. This suggests these zooxanthellae have an ability to fine tune light absorption according to their exposure, or perhaps that these corals contain a yet unreported zooxanthellae clade that inhabits only shaded portions of the coral colony. Results of testing of ITS1 and ITS2 regions of DNA will both identify the clade as C1c. Comments: Found in Pacific Pocillopora spp. (there are no Pocillopora species in the Atlantic; LaJeunesse 2004). C1d is a variant of C42 (which is thought to be a variant of Clade C1c, itself a variant of Clade C1, LaJeunesse, 2005). It is currently believed to be restricted in distribution compared to Clade C1c. Host Species: Cyphastrea sp., Fungia sp., Leptastrea sp., Psammocora sp. Reference: LaJeunesse et al., 2004. Reference: LaJeunesse et al., 2009. Host Species: Found in central Pacific (Hawaiian) stony corals Cyphastrea, Fungia, Leptastrea, and eastern/central Pacific Psammocora spp. Collection depths ranged from 2-15m (LaJeunesse 2004). Believed to have evolved from Clade C1 (LaJeunesse, 2005). Comments: C1g is believed to have evolved from Clade C1, and is possibly endemic to Hawai’i. LaJeunesse, 2004. Host Species: Cyphastrea ocellina, Fungia scutaria, Psammocora sp. Comments: A variant of C1c (which likely evolved from Clade C1). LaJeunesse, 2005. Host Species: The stony coral Turbinaria sp. Reference: Barneah et al., 2007. Host Species: Found largely in Pacific Acroporidae (Acropora, Pocillopora, Montipora) including Acropora aspera, Acropora cerealis (GBR, Van Oppen, 2001), Acropora cervicornis (Caribbean 2.0-17.0m, Baker et al., 1997), Acropora cuneata (Van Oppen et al., 2005), Acropora florida, Acropora gemmifera, Acropora intermedia, Acropora longicyathus, Acropora loripes, Acropora millepora, Acropora nastua, Acropora spathulata, Acropora tenuis, Acropora valida (GBR, Van Oppen, 2001), Goniastrea rectiformis (Van Oppen, 2005), zooxanthellae collected and cultured from the clam Hippopus (LaJeunesse, 2003), Montipora aequituberculata, Montipora capricornis, Montipora danae, Montipora florida (from Indonesia, Van Oppen, 2005 based on ITS2 fingerprint), Pavona varians (Van Oppen, 2005), and Pocillopora damicornis (two locations in Taiwan, 0-5.0m, Chen et al., 2005). Comments: Iglesias-Prieto and Trench (1997) believe clade C2 has good photoacclimatory abilities. However, Berkelmans and van Oppen (2006) state C2 is thermally sensitive to elevated temperatures. Thornhill et al., 2008, found C2 zooxanthellae lowered their chlorophyll content when exposed to very low temperature (10.5°C – 50.9°F), and did not recover within 3 weeks of exposure (the end of the experimental period). Comments: Berkelmans and van Oppen (2006) state the ITS1 rDNA in C2* differs from than in C2 zooxanthellae, and is less thermally sensitive than C2. Reported Geographical Range: Bahamas, Belize, Okinawa, Taiwan, Great Barrier Reef, Hawai’i, NW Hawaiian Islands, Mexican Caribbean, U.S. Virgin Islands, and Kenya. Host Species: This clade is a pandemic generalist zooxanthella, reports seem to indicate this clade is remarkably adaptable over a bathymetric range of 0.3 – 90m (1-294 feet deep, and perhaps even deeper), and it is generally assumed to be adapted to deeper water environments. LaJeunesse, 2002 reports that C3 – along with C3a – were dominant in those corals situated deeper than 5m in waters of the Yucatan (Mexico). Clade C3 (along with C1, C21, C3d, C1c and C45) is believed to be an ancestral type from which other clades evolved (LaJeunesse, 2004). Those corals infected with Clade C3 include Acanthastrea and Acropora (1.0- 90m, LaJeunesse et. al., 2003), Acropora abretinoides,Acropora aculeus (GBR, Van Oppen, 2001), Acropora cuneata (Lord Howe Island, GBR; Wicks et al., 2010), Acropora digitifera, Acropora gemmifera, Acropora glauca, Acropora humilis (Taiwan, 3-5m, Chen, 2005), Acropora hyacinthus (two locations in Taiwan, ranging in depths of 3-10m, Chen, 2005), Acropora intermedia (two locations in Taiwan, ranging in depths of 3-10m, Chen, 2005), Acropora latistella (8-10m, Taiwan, Chen, 2005), Acropora latistella (Van Oppen, 2005), Acropora millepora (GBR, Van Oppen, 2001), Acropora muricata (formosa) (1.0-5.0, Taiwan, Chen, 2005), Acropora palifera (Taiwan, 0-3.0m, Chen, 2005), Acropora pulchra (Taiwan, 5-8m, Chen, 2005), Acropora tenuis (Chen, 2005; Taiwan, 5-8m), Acropora valida (Chen, 2005, Taiwan, 5-8m), Acropora valida (Van Oppen, 2001), Acropora yongei (Chen 2005, Taiwan, 3-5m), Acropora yongei (Solomon Islands), the Hawaiian anemone Boloceroides mcmurrichi,Caulastrea, Cyphastrea, Cyphastrea serailia, Diploastrea, Discosoma sp. (Smith et al., 2009),Echinopora, Caribbean Erythropodia, Favia, Favites (LaJeunesse, 2003), Favites abdita, Galaxeafascicularis (Taiwan, 3-5m, Chen, 2005), Goniastrea sp., Goniastrea favulus, Atlantic Gorgonia, Hydnophora pilosa, the Pacific soft coral Isis, Caribbean Isophyllastrea, Pacific Leptoria, Leptoseris (known to inhabit depths of 90m and more), Lobophyllia, Merulina, Atlantic and Pacific Montastraea (Warner et al., 2006), Montastrea curta, Hawaiian Montipora captitata (Stat et al., 2015), Atlantic and Hawaiian Palythoa spp. (LaJeunesse et al., 2003; LaJeunesse, 2004), Platygyra (LaJeunesse et al., 2003), Hawaiian Pocillopora meandrina (Stat et al., 2015), Kenyan Porites cylindrica (Visram and Douglas, 2006), Porites heronensis, Seriatopora (LaJeunesse et al., 2003), Seriatopora hystrix, Siderastrea (Caribbean, LaJeunesse et al., 2003), Siderastrea intersepta (Belize, 8-25m, Warner, 2006), Siderastrea siderea (Belize, 2-25m, Warner, 2006), New Zealand Sinularia, Caribbean Stephanocoenia, Pacific Symphyllia, Turbinaria frondens (New Zealand; Wicks et al., 2010b), and Caribbean Viatrix (LaJeunesse et al., 2003). Figure 18. Trends suggest Clade C3 is more (or less) tolerant of environmental conditions at various latitudes. It is thought this factor is temperature modulations. From Stat et al., 2015. C3 variant, also known as ‘Gulf C3’, or Symbiodinium thermophilum This variant is remarkably similar to the ‘weedy’cosmopolitan C3 clade (see above) as it varies by only one bp (base pair, the building block of DNA double helix). This species has been found only in the Persian/Arabian Gulf where environmental conditions are extreme and characterized by high temperatures and salinities. It is remarkable in that it apparently adapted to this extreme environment (the Persian Gulf was formed about 15K years ago but shifted to its current temperature regime only in the last ~3-6K. This suggests an ability to rapidly adapt to modulating environmental conditions). Host Species: This specialist clade is reported from Caribbean Agaricia specimens, including A. agaricities (both brown and yellow; LaJeunesse et al., 2003; Thornhill et al., 2006), A. fragilis, A. humilis, A. lamarcki (Warner, 2006) and A. tenufolia. Host Species: This clade seems to also be a specialist, found only in Caribbean Agaricia agaricities and A. lamarki. Host Species: Agaricia agaricites, Isophyllia sinuosa, Mycetophyllia danaana, Mycetophyllia lamarckiana, Mycetophyllia sp., Ricordea florida. Comments: Clade C3d (along with C1, C3, C21, C1c and C45) is believed to be an ancestral type from which other clades evolved (LaJeunesse, 2004). Host Species include Acropora aculeus, Barabattoia sp., Caulastrea sp., Caulastrea furcata, Cynarina sp., Cynarina lacrymalis, Echinophyllia sp., Echinophyllia aspera, Echinophyllia echinata, Echinophyllia orpheensis, Echinopora sp., Echinopora gemmacea, Echinopora hirsutissima, Favites sp., Favites abdita, Fungia sp., Fungia echinata, Fungia fungites, Fungia granulosa, Fungia horrida, Fungia paumotensis, Gardineroseris sp., Goniastrea sp., Goniastrea pectinata, Heliofungia actiniformis, Hydnophora sp., Hydnophora exesa, Leptastrea pruinosa, Leptoseris yabei, Lithophyllia sp., Lithophyllon undulatum, Lobophyllia sp., Lobophyllia hemprichii, Mycedium sp., Mycedium elephantotus, Oulophyllia sp., Oulophyllia crispa, Oxypora sp., Oxypora glabra, Oxypora lacera, Pachyseris sp., Pachyseris rugosa, Pachyseris speciosa, Pavona sp., Pavona explanulata, Pavona maldivensis, Pectinia sp., Pectin lactuca, Platygyra sp., Platygyra daedalei, Platygyra pinni, Platygyra ryukyuensis, Podobacia sp., Polyphyllia sp., Polyphyllia talpina, Sandalolitha sp.,Sandalolitharobusta, Turbinaria frondens, and Turbinaria sp.. Comments: Clade C3h could be considered a generalist clade as it inhabits at least 24 coral genera over a broad range of depths (LaJeunesse et. al., 2003). Common in corals of the Australia’s GBR. Host Species: Gardineroseris, Lobophyllia and Oxypora spp. Host Species: Acropora sp., Acropora cerealis, Acropora cuneata, Acropora florida, Acropora gemmifera, Acropora humilis, Acropora nastua, Acropora nobilis, Acropora tenuis, and Acropora valida. Comments: Believed to have evolved from Clade C1. LaJeunesse et. al., 2003. Reported from Acropora specimens only. Host Species: Found (so far) in only soft coral genera Lobophytum, Sarcophyton and Sinularia spp. Host Species: Acropora spp., Acropora cuneata, Acropora digitifera, Acropora divaricata, Acropora florida, Acropora humilis, Acropora hyacinthus, Acropora millepora, Acropora monticulosa, Acropora nastua, Acropora nobilis, Acropora palifera, Acropora valida. Comments: Clade found in Acropora species only. Host Species: Colpophyllia and Diploria spp. Comments: Believed to have evolved from Clade C1 and C3, making it unique among zooxanthellae (LaJeunesse, 2005). Comments: Present in coral before and after bleaching event caused by warm water. LaJeunesse et al., 2009. Comments: Present in coral 3 months into a bleaching event caused by warm water. LaJeunesse et al., 2009. Host Species: Acropora millepora (green), Acropora sp., Euphyllia ancora, and Turbinaria sp. Host Species: Acropora valida, Coscinarea mcneilli,Porites sp., Porites furcata, Strombus gigas (conch). Host Species: From a Kenyan (western Pacific) Acropora hyacinthus (Visram and Douglas, 2006) and a Caribbean Zoanthus sp. (LaJeunesse, 2005). Comments: Evidence suggests this clade is widely distributed. Comments: C6 is apparently widely distributed (? ), but only rarely reported. Visram and Douglas (2006) found this clade in a Kenyan Acropora valida, and LaJeunesse (2003) found it in a Caribbean stony coral Mycetophyllia. Comments: Montastrea annularis (8-15m) and Montastraea faveolata (8-25m) in Belize (Warner, 2006) and in the stony coral Pocillopora damicornis (0.3-8m) in Kenya (Visram and Douglas, 2006). Host Species: Pocillopora damicornis, Stylophora pistillata, Stylophora sp. Comments: Pocillopora damicornis (Kenya; 0.3-8m; Visram and Douglas, 2006), Western Pacific Stylophora sp. (5-25m; LaJeunesse et. al., 2003) and a GBR Stylophora pistillata (LaJeunesse et al., 2004). LaJeunesse believes C8 evolved from C1c (itself a variant of Clade C1). Stylophora pistillata colonies (at depths of 3 -18m; 10-59 feet) containing C8 bleached at 28.1°C (82.6°F), losing 60-70% of their zooxanthellae, although they remained apparently healthy. Sampayo et al. (2008), on studies conducted at Heron Island, southern Great Barrier Reef. More tolerant of warm water than clades C35, C35a, and C79. Comments: LaJeunesse (2003; 2004) reports a Stylophora sp. and Stylophora pistillata to contain this clade. It seems restricted to deeper depths (~10m) and is thermally tolerant (Sampayo et al., 2008). A ‘sub-clade’ of C8 (LaJeunesse, 2005). See comments in ‘C8’ (above). Stylophora pistillata colonies (at depths of 3 -18m; 10-59 feet) containing C8a bleached at 28.1°C (82.6°F), losing 60-70% of their zooxanthellae, although they remained apparently healthy. Sampayo et al. (2008), on studies conducted at Heron Island, southern Great Barrier Reef. More tolerant of warm water than clades C35, C35a, and C79. Comments: This zooxanthella strain is found in a stony coral Stylophora sp. but at shallower depths (2-3m) than Clade C8a (LaJeunesse et. al., 2003). A ‘sub-clade’ of C8 (LaJeunesse, 2005). See comments in ‘C8’ (above). Comments: Pocillopora damicornis from Kenya (Visram and Douglas, 2006) and Poritesdivaricata (colored yellow or brown) from the Caribbean (LaJeunesse et. al., 2003). Host Species: Pocillopora damicornis from Kenya (Visram and Douglas, 2006), Porites porites and a Porites sp. from the Caribbean (LaJeunesse et. al., 2003). Depths ranged from 0.3 to 15m. Comments: Evidence suggests this far-flung clade is pandemic. Host Species: Pocillopora damicornis Kenya and a Porites sp. (Caribbean, 0.5-2m). References are Visram and Douglas, 2006 and LaJeunesse et. al., 2003, respectively. Hosts: Aglaophenia (hydroid), Anacropora spinosa, Anphanipathes sp., Heteroxenia, Montipora sp., Montipora confusa, Montipora digitata, Montipora digitata (from Palau) Montipora digitata (green, from Solomon Islands), Montipora digitata (red, from Solomon Islands), Montipora capricornis, Montipora capricornis (brown, from Solomon Islands), Montipora sp. (green, plating), Montipora spongodes, Montipora spongodes (green), Montipora stellata, Myriopathes sp. (Wagner et al., 2010), Pocillopora damicornis, Porites sp., Porites brighami, Porites compressa, Porites cylindrica, Porites lutea (evermanni), and Porites lobata, Porites rus, and Seriatopora hystrix (brown with green polyps). C15 is also found in Aglaophenia, Heteroxenia (western Pacific, both sampled at 1.0 -15.m LaJeunesse et al., 2003), Montipora (GBR, Pochon, 2004), Montipora (probably M.digitata at 1.0-15.0, LaJeunesse et al., 2003), Pocillopora damicornis (0.3-8.0m, Kenya, Visram and Douglas, 2006), Porites sp. from various Pacific locations (LaJeunesse et. al., 2003 and Pochon et al., 2004), Porites brighami (at 20m in Hawaii, LaJeunesse et al., 2003); Poritescompressa (Hawaii, 15-25m, LaJeunesse et al., 2003), Porites cylindrica (GBR, LaJeunesse et al., 2003), Porites evermanni (now P. lutea, Hawaii, 5.0-20.0m, LaJeunesse, 2004), Porites lobata (Hawaii, 2-20m, LaJeunesse, 2003), Porites lutea (purple variant, 1.5m, Hawaii, Smith et al., 2009). Comments: C15 is considered tolerant of high and low temperatures. It is also tolerant of extremes in light intensity – corals containing C15 can be found in the shallowest of tide pools as well as hosts (black corals) in extremely deep water (~1,300 feet). Often found in Pacific Porites spp., though not exclusive of other genera. See Figures 6 and 7 (above) and 8 (below) for further information. Possibly a variant of Clade C3 (LaJeunesse, 2005). Figure 19. Relationship between Clade C15 and its subclades, along with host taxa. Figure 20. 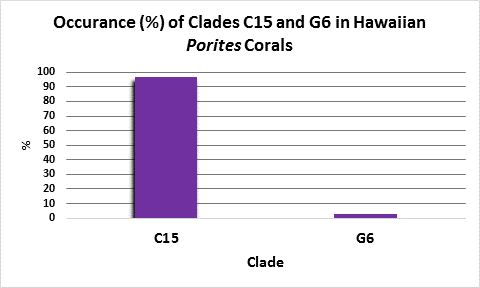 Clade C15 is the predominant zooxanthellae clade found in Porites corals of the NW Hawaiian Islands. From Stat et al., 2015. Comments: A variant of C15. LaJeunesse et al., 2003. Comments: A variant of C15 (LaJeunesse, 2004). Host Species: Porites, Pavona spp. Comments: Stat et al., 2015. Hosts: Pocillopora damicornis, Porites sp., Siderastrea intersepta, Stephanocoenia sp. Comments: Siderastrea intersepta (Warner 2006) and Stephanocoenia sp. (LaJeunesse et. al., 2003). Both from the western Caribbean. Hosts: Montipora sp., Montipora aequituberculata, Montipora capitata, Montipora foliosa, Montipora monasteriata, Porites sp. Note: Zooxanthellae were identified as C17 in brown and purple Montipora monasteriata specimens. Comments: Listed by LaJeunesse (2005) without specifics. Hosts: Acropora latistella, Archelia sp., Cyphastrea sp., Echinophyllia sp., Echinopora sp., Echinopora lamellosa, Favia sp., Favites sp., Fungia sp., Leptoseris explanata, Merulina sp., Montipora sp., Montipora faveolata, Montipora flabellata, Montipora monasteriata, Pachyseris speciosa, and Pavona explanata. Hosts: Corals Cyphastrea, Echinophyllia, Favites, Galaxea, Hydnophora, Lobophyllia, Lobophyllia corymbosa, Pectinia, Symphyllia (all LaJeunesse, et al., 2003), and the stony coral Turbinaria (LaJeunesse, 2004) have been found to contain C21a. Predominantly, if not exclusively, found in the northern hemisphere and often in waters around Okinawa, Japan. Hosts: Acanthopathes undulata, Anphanipathes sp., Antipathes griggi, Antipathes grandis, Bathypathes sp., Cirrhipathes anguina, Myriopathes sp., Stichopathes sp. Hosts: Found (so far) in Lobophyllia, Lobophyllia corymbosa and Turbinaria sp., Turbinaria heronensis, and Turbinaria peltata. Hosts: Found in octocorals Briareum and Isis spp. (LaJeunesse, 2005). Comments: Believed to have evolved from Clade C1. Hosts: Isolated from the zoanthid Palythoa. Comments: Believed to have evolved from Clade C1, and co-evolved along with Clade 41 (found in a number of Red Sea stony corals), LaJeunesse, 2005. Hosts: Heteractis, Heteractis magnifica anemone. Comments: A rare or host-specific clade, believed to have evolved from Clade C1, and co-evolved along with C59 (found in some Seriatopora specimens, LaJeunesse, 2005). Host Species: Reportedly found only in Montipora species, including M. capitata and M. stellata. Hosts: Isolated from Montipora species, Montipora capitata (collected in waters deeper than 15m), Montipora hispida, Montipora monasteriata, and Montipora turtlensis. Also found in aquarium corals: Montipora sp., Montipora aequituberculata, and Montipora capricornis. Comments: LaJeunesse (2004) believed to have evolved from C21. Hosts: Alveopora sp., Coscinaraea sp., Fungia sp., Fungia danai, Hydnophora sp., Hydnophora exesa, hydrocoral Millepora sp., Pachyseris sp., Pachyseris speciosa, Pavona, Pavona duerdeni, and Pavona varians. Also found in aquarium corals: Euphyllia divisa, and Fungia sp. References: LaJeunesse et al., 2003 and LaJeunesse et al., 2004. Reported Geographical Range: Western Pacific; Okinawa, Japan. Comments: M. flabellata often lives in waters shallower than collection depths listed above. Comments: Pocillopora molokensis is restricted to deeper waters, suggesting Clade 34 prefers less light, UVR, or lower temperatures. Comments: Sensitive to heat stress. Stylophora pistillata colonies (at depths of 3 -6m; 10-20 feet) containing C35 suffered significant bleaching at 28.1°C (82.6°F), losing ~100% of their zooxanthellae. Studies conducted at Heron Island, southern Great Barrier Reef. Less tolerant of warm water than clades C8, C8a, and C78 (also found there in S. pistillata colonies; Sampayo et al., 2008). Host Species: Coeloseris sp., Goniastrea sp. Host Species: Echinopora lamellosa, Echinopora hirsutissima, Mycedium elephantotus, Symphyllia radians, Symphyllia recta, Turbinaria frondens, Turbinaria reniformis, and Turbinaria stellulata. Host Species: Acropora sp., Acropora hemprichii, Platygyra sp., Plesiastrea sp., Plesiastrea laxa, Turbinaria sp. Comments: Listed by LaJeunesse (2005) without further comment. Host Species: Platygyra sp. ; Porites sp. Host Species: Anthelia, Heteroxenia, Klyxum, and Xenia spp. Host Species: Hicksonella sp., Hicksonella expansa, Lobophyllia, Sarcophyton, Sinularia spp., and from a Sinularia (with green branch tips) maintained in an aquarium. Host Species: Hicksonella, Lobophyllia, Sarcophyton, Sinularia spp. LaJeunesse (2005) refers to this clade without specifics. Comment: Listed by LaJeunesse 2005 without elaboration. Comments: Thermally tolerant, relative to Clades C79 and C35a (Sampayo et al., 2008). Comments: Stylophora pistillata colonies (at depths of 3 -18m; 10-59 feet) containing C8a bleached at 28.1°C (82.6°F), losing 60-70% of their zooxanthellae, although they remained apparently healthy. Sampayo et al. (2008), on studies conducted at Heron Island, southern Great Barrier Reef. More tolerant of warm water than clades C35, C35a, and C79. Incorrectly identified as C1 in a previous work (Sampayo et al., 2007). Comments: Sensitive to heat stress. Stylophora pistillata colonies (at depths of 15-18m; 10-20 feet) containing C35 suffered significant bleaching at 28.1°C (82.6°F), losing ~100% of their zooxanthellae. Studies conducted at Heron Island, southern Great Barrier Reef. Less tolerant of warm water than clades C8, C8a, and C78 (also found there in S. pistillata colonies; Sampayo et al., 2008). Listed by LaJeunesse 2005 without elaboration. Host Species: Montipora sp., and Montipora capricornis (green morph). Comments: Aquarium coral. Smith et al., 2009. Host Species: Echinopora sp. and Polyphyllia sp. Host Species: Acropora sp., Acropora sp. (blue), Acropora sp. (blue branch tips), Acropora sp. (green tabletop), Acropora cervicornis (? ), Acropora granulosa (along with Clade C21), Acropora humilis, Acropora millepora (pink), and Acropora valida (purple branch tips), as well as a flat worm taken one of the specimens listed above (an interesting observation – is the flat worm parasitic, or simply eats ejected zooxanthellae?). Comments: Pocillopora damicornis colonies harboring C100 were tolerant of temperatures between 15°C and 29°C (~59 and 84°F) and bleached outside this range. PAM fluorometry revealed C100 is more sensitive to warmer temperatures (especially in the presence of light of up to 2,000 µmol·m²·sec). Wicks et al., 2010. Results of testing of ITS1 and ITS2 regions of DNA will both identify the clade as C100. Host Species: Acropora formosa (now A.muricata; blue morph), Acropora valida (purple morph), Acropora sp. (“Miami Orchid”), and bright-yellow Acropora sp. Comments: C103 has, so far, been reported in only Pocillopora damicornis colonies, and even then those in ‘deeper’, more turbid waters. Wicks et al., 2010a. Results of testing of ITS1 and ITS2 regions of DNA will both identify the clade as C103. Comments: Wicks et al., 2010b. Results of testing of ITS1 and ITS2 regions of DNA will both identify the clade as C111. Comments: Wicks et al., 2010a & b.
Chen et al., 2003, found this clade within high latitude corals Oulastrea crispata and Goniastrea aspera inhabiting marginal sites (extreme temperatures, turbidity and irradiance); Baum et al. (2010) found Clade D (along with Clade A) in Florida Acropora cervicornis specimens inhabiting areas with wide temperature fluctuations, high nutrient loading and high sedimentation. This zooxanthella is thus considered extremely stress tolerant and opportunistic (‘opportunistic zooxanthella’ would be defined as one possessing traits or characteristics making it competitive in a marginal environment – such as high or low temperature, etc.). On the other hand, Abrego et al. (2008) found a Clade D in Acropora tenuis to be less resistant to environmental extremes than C1 in other A. tenuis specimens. Is Clade C1 simply more robust and less prone to bleaching induced by relatively warm water temperature? Is Clade D as described by Abrego et al. in reality a subclade in the D-class? These researchers used ITS1 portions to identify the clades, instead of the ITS2 portion of the RNA used by many other scientists. Abrego et al. 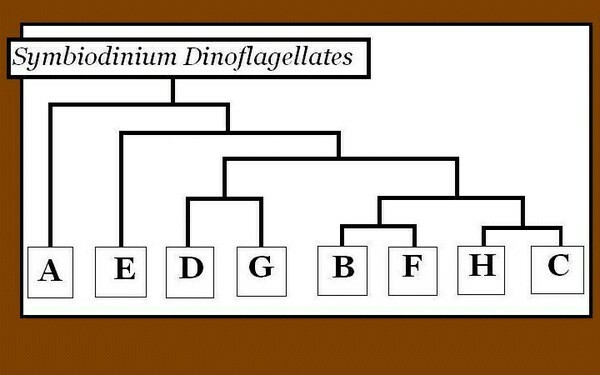 (2008) found a clade identified only as “D” to produce protective xanthophyll pigments. Clade D is the proper classification for symbionts listed in earlier works by Carlos et al. (1999) and Toller (2001 a, b). Figure 21. Relative abundance of the D clade found in Caribbean corals. Figure 22. Relative abundance of clade D1a in corals found on Australia’s Great Barrier Reef. Hosts: Acropora millepora, Agaricia humilis, Diploria labyrinthiformis, Montastrea franksi, Montastrea faveolata, Pocillopora elegans, Seriatopora hystrix, Siderastrea sidereal Stephanocoenia michellini, and Stephanocoenia intersepta. Hosts: Acropora palifera, Oulastrea crispata (Taiwan); Pocillopora spp. (Gulf of California). Also found in these corals in association with Clade C1 at depths of 8-15m (26-49 feet): Acropora palifera, Euphyllia ancora, Euphyllia parancora, Turbinaria mesenteria. Found in an Acropora sp. (orange morph) maintained in an aquarium. Hosts: Agaricia sp., Antipathes griggi, Diploria spp., Echinopora hirsutissima, Goniastrea favulus, Hydnophora microconus, Meandrina meandrites, Montastrea annularis, Montastrea cavernosa, Montastrea faveolataMontipora capitata (orange), Montipora patula, Nephthea, Porites astreoides, Porites divaricate, Porites porites, and Siderastrea siderea. Found in captive corals Euphyllia sp. and Hydnophora sp. (Smith et al., 2009). Comments: Thermally-tolerant, adaptable to low light, and opportunistic. Hosts: Pocillopora damicornis and Seriatopora hystrix. Comments: Aquarium corals. (Smith et al., 2009). Hosts: Acropora sp., Acropora bruegmanni, Acropora cuneata, Acropora palifera, Galaxea fasicularis, Goniopora fruticosa, Pavona desucata, Pocillopora elegans, Pocillopora verrucosa. Comments: Clade D2 apparently prefers environments with high light. Comment: The numerical portion of the clade ID is based on the length (base pairs or bp) of a variable region in the chloroplast 23 s rDNA genes, and not the ITS1 or ITS2 regions used by many researchers. Those zooxanthellae listed as Clade E in Toller et al., (2001) have been reclassified as Clade D. Symbiodinium muscatinei and S. californium (from the anemone Anthopleura) are sometimes listed as belonging to Clade E; they are listed as Clade B (above). Zwada and Jaffe (2003) found Caribbean Montastrea faveolata specimens (collected of depths of 7 to 11 meters) contained zooxanthellae belonging to Clade E. It is thought that thermally sensitive clades (such as B1, C1, and E) rely on the Mehler Reactions more than the thermally tolerant clade F1. Roberty et al., 2015.) In other words, enzymes destroying oxygen radicals and hydrogen peroxide prevent cellular damage. If these enzymes are overwhelmed, great harm to zooxanthellae and the host could result. Normally found in foraminiferans, researchers were surprised when Clade Fr2 was found in isolated ‘daisy coral’ specimens (Alveopora japonica) in Korea. (Rodriguez-Lanetty et al., 2000). Another clade, F5, occurs in Montipora capitata, as well as Sinularia sp. (Guam), Meandrina meandrites (Jamaica) and a Floridian Porites astreoides (Rodriguez-Lanetty, 2003. It is thought that thermally sensitive clades (such as B1, C1, and E) rely on the Mehler Reactions more than the thermally tolerant clade F1. Symbiodinium kawaguti. This zooxanthella species (designated as Clade F5) is found within the coral Montipora capitata (formerly M. verrucosaand found in Hawaii and Australia). No protective xanthophylls are produced as a response to super-saturating irradiance (Iglesias-Prieto and Trench, 1997), and this zooxanthella (and host) does poorly in high light intensity. It is interesting that both corals containing Clade F are found at higher latitudes. Note: Listed in the Encyclopedia of Life (eol.org) as a Symbiodinium species. This is a thermally tolerant species. Sometimes referred to as F5. Reported Depth Range: <18 meters (< 59 feet); <20 meters for Hawaiian Porites. Hosts: ‘Giant’ sea anemones; Junceella fragilis, Euplexaura nuttingi, Stereonephthya sp. #1, Hawaiian Porites stony corals. Figure 23. Clade G6 has been found, if only rarely, in NW Hawaiian Island Porites corals. From Stat et al., 2015. There are several approaches in using this list. The first, and perhaps simplest, is applicable to those with an established tank in which specimens are thriving. 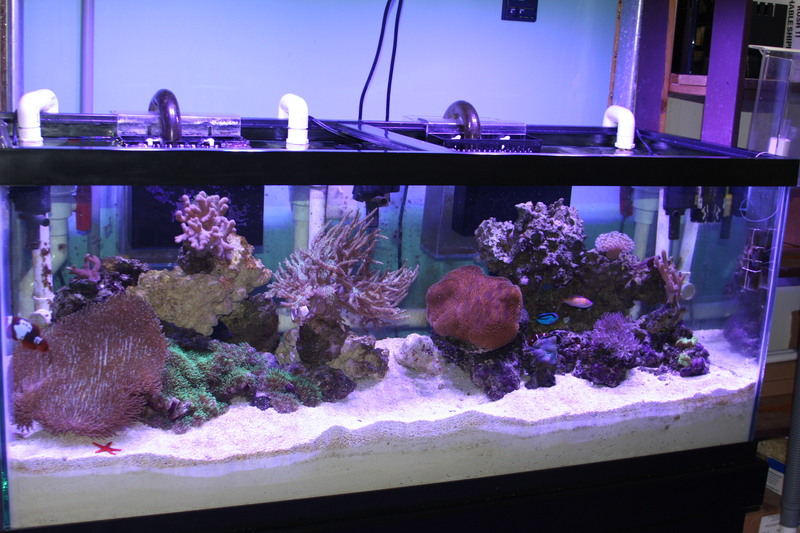 Any coral with a matching zooxanthellae clade will probably do well within the same aquarium. A more precise, though limited method, requires use of a quantum or PAR meter. Compare the PAR measurement from the corals intended place to the PAR measurements within the list. Column 1. Animal hosts are most often listed using Latin names – a necessity considering the confusion a list of this sort would generate if common names (i.e., Bali green hairy mushroom) were used. Use of the listing may therefore require some effort on the hobbyist’s part for proper identification (at least to the genus level). Such references are readily available to hobbyists. I have also included clades when they are only casually mentioned in a journal article and no coral host is mentioned (designated as “?”). Column 2. Practical information is often included about the regional location of the host invertebrate. It is soon realized that Porites coral are pandemic, while some corals are endemic to certain isolated areas (Hawaiian coral species are a good example). Though it is not likely that Hawaiian corals are found in home aquaria, it is possible a zooxanthellae clade is not restricted to the Hawaiian Archipelago, and may be found in host corals from other regions. Therefore, this information is of potential use since we have information on photosynthetic saturation levels of some Hawaiian corals. Abbreviations are: AC = Atlantic Caribbean; C = Caribbean (C, for Caribbean, is also used as a prefix to identify location in countries with Atlantic and Pacific shorelines, i.e., Panama); CC = Central Caribbean; Central GBR = Central Great Barrier Reef, eastern Australia; CP = Central Pacific; EC = Eastern Caribbean; EP = Eastern Pacific; GBR = Great Barrier Reef, eastern Australia; IP = Indo-Pacific Ocean; NC = Northern Caribbean; NWHI = Northwest Hawaiian Islands; P-Panama = Pacific shore of Panama; RS = Red Sea; Taiwan-KT = Kenting Island; Taiwan-PI = Penghu Island; WC = Western Caribbean; WI = Western Indian Ocean; and WP = Western Pacific. Column 3. Truncated comments are included for ease of reference, along with journal references for further study. During review, one will quickly realize how diverse the genus Symbiodinium actually is. 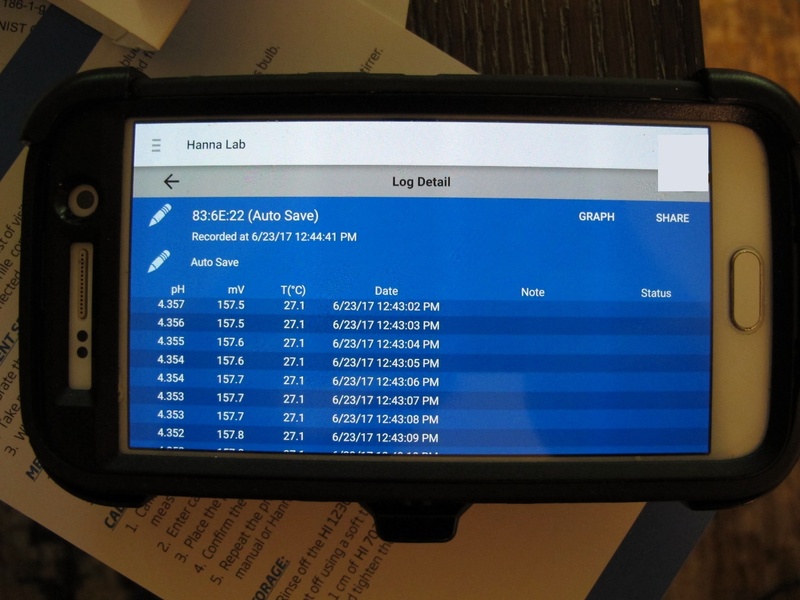 Instead of making things more complicated, all this information will begin to make things easier for hobbyists in that trends begin to evolve and, at times, generalizations can be made. These, along with the quality and quantity of rapidly evolving information, will someday precisely answer many of the remaining questions about the lighting requirements of those animals in our captive reefs. Occasionally, I have added some light requirement information, and have made an assumption that a particular subclade (C27, for instance) will have the same range of light needs regardless of location (and will react in the same manner to saturating light intensity within an aquarium). This is based on P/I curves of Hawaiian corals and cross-referenced with light ranges made in the field by researchers referenced below. The saturation numbers listed in this column are full-blown saturation levels (not saturation onset numbers) where increasing light intensity will not increase the rate of photosynthesis. Kirk (1983) recommends saturation onset as the standardized method of reporting photosynthetic saturation. I have chosen otherwise, since coral geometry is often highly irregular and subject to shading. Using full saturation as the standard should ensure that shaded areas have sufficient light. Column 4. Appropriate journal references. Full information is available below. Abrego, D., K. Ulstrap, B. Willis, and M. van Oppen, 2008. Species-specific interactions between endosymbionts and coral hosts define their bleaching response to heat and light stress. Proc. Royal Soc. B, 275:2273-2282. ———–, 2003. Flexibility and specificity in coral/algal symbiosis: Diversity, ecology and biogeography of Symbiodinium. Annu. Rev. Ecol. Syst., 34:661-689. ———–, In Press. Symbiont diversity on coral reefs and its relationship to bleaching resistance and resilience. ————, and R. Rowan, 1997. Diversity of symbiotic dinoflagellates (zooxanthellae) in scleractinian corals of the Caribbean and eastern Pacific. Proc. 8th Int. Coral Reef Symp., Panama. 2: 1301-1306. ————-, R. Rowan and N. Knowlton, 1997. Symbiosis ecology of two Caribbean Acroporid corals. Proc. 8th Int. Coral Reef Symp., Panama. 2:1295-1300. ——————, T. LaJeunesse and R. Trench, 2000. The synthesis of mycosporine-like amino acids (MAAs) by cultured, symbiotic dinoflagellates. J. Exp. Mar. Biol. Ecol., 249: 219-233. ————-, I. Brickner, M. Hodge, V. Weiss, T. LaJeunesse, and Y. Benayahu, 2007. Three party symbiosis: Acoelomorph worms, corals and unicellular algal symbionts in Eilat (Red Sea). Mar. Biol. Baums, I., M. Johnson, M. Delvin-Durante, and M. Miller, 2010. Host population genetic structure and diversity of two reef-building coral species along the Florida Reef Tract and wider Caribbean. Coral Reefs, 29:835-842. Berkelmans, R. and M. van Oppen, 2006. The role of zooxanthellae in the thermal tolerance of corals: a ‘nugget of hope’ for coral reefs in an era of climate change. Proc. Royal Soc. B., 273:2305-2312. Costa, C., R. Sassi, and K. Gorlach-Lira, 2008. Zooxanthellae genotypes in the coral Siderastrea stellata from coastal reefs in northeastern Brazil. J. Exp. Mar. Biol. Ecol., 367(2):149-152. ————, D. Poland, E. Petrou, D. Brazeau, and J. Holmberg, 2010. Environmental symbiont acquisition may not be the solution to warming seas for reef-building corals. PlosOne, 5(10): e13258. Crabbe, M., and J. Carlin, 2009. Multiple Symbiodinium clades in Acropora species scleractinian corals from the Ningaloo reef, Australia. Int. J. Integr. Biol., 5(2):72-74. DePalmas, S., V. Den is, L. Ribas-Deulofeu, M. Lombeyres, S. Woo, S.J. Wong, J. I. Song, and C.A. Chen, 2015. Symbiodinium spp. Associated with high-latitude scleractinian corals from Jeju Island, South Korea. Coral Reefs, 34:99-925. Diaz-Almeyda, E., P. Thome, M. El Hafidi, and R. Iglesias-Prieto, 2011. Differential stability of photosynthetic membranes and fatty acid composition at elevated temperature in Symbiodinium. Coral Reefs, 30:217-225. ————, J. Mieog, P. Colin, D. Idip, and M. van Oppen, 2004. Identity and diversity of coral reef endosymbionts (zooxanthellae) from three Palauan reefs with contrasting bleaching, temperature and shading histories. Mol. Ecol., 13(8):2445-2458. Goulet, T. Grottoli-Everett, A.G. and L.B. Kuffner, 1995. Uneven bleaching within the colonies of the Hawaiian coral Montipora verrucosa. In: Ultraviolet Radiation and Coral Reefs. D. Gulko and P.L. Jokiel, Eds. HIMB Tech. Report #41. · Hume, B., C. D’Angelo, E. Smith, J. Stevens, J. Burt, and B. Weidenmann, 2015. Symbiodinium thermophilum sp. nov., a thermotolerant symbiotic alga prevalent in the world’s hottest sea, the Persian/Arabian Gulf. Scientific Reports, 5: 8562. Hunter, C.L., C.W. Morden, and C.M. Smith, 1997. The utility of ITS sequences in assessing relationships among zooxanthellae and corals. Proc. 8th Int. Coral Reef Symp., Panama. 2: 1599-1602. Iglesias-Prieto, R. V. Beltram, T. LaJeunesse, H. Reyes-Bonilla, and P. Thomas, 2004. Different algal symbionts explain the vertical distribution of dominant reef corals in the eastern Pacific. Proc. R. Soc. Lond. B., 271:1751-1763. Jones, A., R. Berkelmans, M. van Oppen, J. Mieog, and W. Sinclair, 2008. A community change in the algal symbionts of a scleractinian coral following a natural bleaching event: field evidence of acclimatization. Proc. Royal Soc. B, 275:1359-1365. Kahng, S. and J. Maragos, 2006. The deepest, zooxanthellate scleractinian corals in the world? Coral Reefs, 25(2):254. —————–, 2000b. Investigating the biodiversity, ecology and phylogeny of endosymbiotic dinoflagellates in the genus Symbiodinium using the ITS region in search of a species level marker. J. Phycol., 37: 866-890. —————–, 2002. Diversity and community structure of symbiotic dinoflagellates from Caribbean coral reefs. Mar. Biol., 141: 387-400. ——————, W. Loh, R. vanWoesik, O. Hoegh-Guldberg, G. Schmidt and W. Fitt, 2003. Low symbionts diversity in southern Great Barrier Reef corals, relative to those in the Caribbean. Limnol. Oceanogr., 48(5):2046-2054. —————–, D. Thornhill, E. Cox, F. Stanton, W. Fitt and G. Schmidt, 2004. High diversity and host specificity observed among symbiotic dinoflagellates in reef coral communities from Hawaii. Coral Reefs, 23:596-603. ———————-, R. Bhagooli, M. Hidaka, L. de Vantier, T. Done, G. Schmidt, W. Fitt and O. Hoegh-Guldberg, 2004b. Closely related Symbiodinium species differ in relative dominance in coral reef host communities across environmental latitudinal and Biogeographical gradients. Mar. Ecol. Prog. Ser., 284: 147-161. ——————, 2005. “Species” radiations of symbiotic dinoflagellates in the Atlantic and Indo-Pacific since the Miocene-Pliocene transition. Mol. Biol. Evol. 22(3): 570-581. ———————, G. Lambert, R. Andersen, M. Coffroth, and D. Galbraith, 2005. Symbiodinium (Phyrhophyta) genome sizes (DNA content) are smallest among dinoflagellates. J. Phycol., 41: 880-886. ——————, S. Lee, S. Bush and J. Bruno, 2005b. Persistence of non-Caribbean algal symbionts in Indo-Pacific mushroom corals released to Jamaica 35 years ago. Coral Reefs, 24(1): 157-160. ———————, H. Reyes-Bonilla and M. Warner, 2007. Spring ‘bleaching’ among Pocillopora in the Sea of Cortez, Eastern Pacific. Coral Reefs, in press. ———————, W. Loh and R. Trench, 2008. Do introduced endosymbiotic dinoflagellates ‘take’ to new hosts? Biol. Invasions. ——————–, W. Fitt and G. Schmidt, 2010. The reticulated chloroplasts of zooxanthellae (Symbiodinium) and differences in chlorophyll localization among life cycle stages. Coral Reefs, 29:627. ——————–, R. Smith, J. Finney, and H. Oxenford, 2009. Outbreak and persistence of opportunistic Symbiodinium dinoflagellates during the 2005 Caribbean mass coral bleaching event. Proc. Royal Soc. B., 276:4139-4148. ——————–, R. Smith, M. Walther, J. Pinzon, D. Pettay, M. McGinley, M. Aschaffenburg, P. Medina-Rosas, A. Cupul-Magana, A. Lopez Perez, H. Reyes-Bonilla, and M. Warner, 2010. Host-symbiont recombination versus natural selection in the response of coral-dinoflagellate symbioses to environmental disturbance. Proc. Royal Soc. B., 277:2925-2934. McClanahan, T., J. Maina, R. Moothien-Pillay, and A. Baker, 2005. Effects of geography, taxa, water flow, and temperature variation on coral bleaching intensity in Mauritius. Mar. Ecol. Prog. Ser., 298: 131-142. Oliver, T. and S. Palumbi, 2011. Many corals host thermally resistant symbionts in high temperature environment. Coral Reefs, 30:241-250. ————-, T. LaJeunesse, and J. Pawlowski, 2004. Biogeographical partitioning and host specialization among foraminiferan dinoflagellates symbionts (Symbiodinium: Dinophyta). Mar. Biol., 146:17-27. ————–, J. Montoya-Burgos, B. Stadelmann and J. Pawlowski, 2005. Molecular phylogeny, evolutionary rates, and divergence timing of the symbiotic dinoflagellates genus Symbiodinium. Molecular Phylogenetics and Evolution, in press. ———, R. Gademan, A. Larkum and M. K005. Temporal patterns in effective quantum yield of individual zooxanthellae expelled during bleaching. J. Exp. Mar. Biol. Ecol., 316: 17-28. Robery, S., D. Fransolet, P. Cardol, J.-C. Plumier and F. Franck, 2015. Imbalance between oxygen photoreduction and antioxidant capacities in Symbiodinium cells exposed to combined heat and high light stress. Coral Reefs, 34: 1063-1073. Rodriguez-Lanetty, M., 2002. Evolving lineages of Symbiodinium-like dinoflagellates based on ITS1 rDNA. Molecular Phylogenetics Evolution, 28: 152-168. ———————–, H. Cha, and J. Song, in press. Genetic diversity of symbiotic dinoflagellates associated with anthozoans from Korean waters. Proc. 9th Int. Coral Reef Symp. ———————–, and O. Hoegh-Guldberg, 2003. Symbiont diversity within the widespread scleractinian coral Plesiastrea verispora, across the northwestern Pacific. Mar. Biol., 143:501-509. ———————–, D. Krupp, and V. Weis, 2004. Distinct ITS types of Symbiodinium in Clade C correlate with cnidarian/dinoflagellate specificity during onset of symbiosis. Mar. Ecol. Prog. Ser., 275:97-102. ———————-, W. Loh, D. Carter, and O. Hoegh-Guldberg, 2001. Latitudinal variability in symbiont specificity within the widespread scleractinian coral Plesiastrea verispora. Mar. Biol., 138:1175-1181. Sampayo, E., T. Ridgway, P. Bonagerts, and O. Hoegh-Guldberg. Bleaching susceptibility and mortality of corals are determined by fine-scale differences in symbiont type. PNAS, 105(30): 10444-10449. ———–, T. Shearer, A. Hannes and M. Coffroth, 2004. Fine-scale diversity and specificity in the most prevalent lineage of symbiotic dinoflagellates (Symbiodinium, Dinophyceae) of the Caribbean. Molecular Ecology, 13: 459-469. ————–, H. Trapido-Rosenthal and A. Douglas, 2002a. On the functional significance of molecular variation in Symbiodinium, the symbiotic algae of Cnidaria: Photosynthetic response to irradiance. Mar. Ecol. Prog. Ser., 244: 27-37. Shearer, T., C. Gutierez-Rodrigez and M. Coffroth, 2005. Generating molecular markers from zooxanthellate cnidarians. Coral Reefs 24: 57-66. Smith, R., J. Pinzon, and T. LaJeunesse, 2009. Aquarium corals under long-term cultivation maintain Symbiodinium spp. found in wild populations. J. Phycol., 45(51):1030-1036. ——–., E. Morris, and R. Gates, 2008. Functional diversity in coral-dinoflagellate symbiosis. PNAS, 105(27): 9256-9261. ——-, D. Yost and R. Gates, 2015. Geographic structure and host specificity shape the community composition of symbiotic dinoflagellates in corals from the Northwestern Hawaiian Islands. Coral Reefs, 34:075-1086. Strychar, K., M. Coates, P. Sammarco, T. Piva, T. and P. Scott, 2005. Loss of Symbiodinium from bleached soft corals Sarcophyton ehrenbergi, Sinularia sp and Xenia sp.. J. Exp. Mar. Biol. Ecol., 320 2: 159-177. Suggett, D., M. Warner, D. Smith, P. Davey, S. Hennige, and N. Baker, 2008. Photosynthesis and production of hydrogen peroxide by Symbiodinium (Pyrrhophyta) phylotypes with different thermal tolerances. Phycol. Soc. America. Tchernov, D., M. Gorbunov, C. de Vargas, S. Yadav, A. Milligan, M. Hublom, and P. Falkowski, 2004. Membrane lipids of symbiotic algae are diagnostic of sensitivity to thermal bleaching in corals. Proc. Natl. Acad. Sci. USA, 101, 37: 13531-13535. ————, D. Kemp, B. Bruns, W. Fitt and G. Schmidt, 2008. Correspondence between cold tolerance and temperate biogeography in a western Atlantic Symbiodinium (Dinophyta) lineage. J. Phycol., 44:1126-1135. ———-, P. Ralph, A. Larkum and M. Kuhl, 2006. Intra-colonial variability in light acclimation of zooxanthellae in coral tissues of Pocillopora damicornis. Mar. Biol. 149: 1325-1335. ——————, F. Palstra, A. Piquet and D. Miller, 2001. Patterns of coral-dinoflagellate associations in Acropora: Significance of local availability and physiology of Symbiodinium strains and host-symbiont selectivity. Proc. R. Soc. Lond B., 268: 1759-1767. ——————-, J. Mieog, C. Sanchez, and K. Fabricius, 2005. Diversity of algal endosymbionts (zooxanthellae) in tropical octocorals: the roles of geography and host relationships. Mol. Ecol., 14: 2403-2417. ——————–, A. Mahiny, and T. Done, 2005b. Geographical distribution of zooxanthella types of three coral species of the Great Barrier Reef sampled after the 2002 bleaching events. Coral Reefs, in press. Venera-Ponton, D., G. Diaz-Pulido, M. Rodriguez-Lanetty and O. Hoegh-Guldberg, 2010. Presence of Symbiodinium spp. in microalgal microhabitats from the southern Great Barrier Reef. Coral Reefs, 29:1049-1060. Venn, A., J. Loram, H. Trapido-Rosenthal, D. Joyce and A. Douglas, 2008. Importance of time and place: Patterns in abundance of Symbiodinium Clades A and B in the tropical sea anemone Condylactis gigantea. Biol. Bull., 215:243-252. · Wakefield, T. and S. Kempf, 2001. Development of host- and symbiont-specific monoclonal antibodies and confirmation of the origin of the symbiosome membrane in a cnidarian-dinoflagellate symbiosis. Biol. Bull., 200: 127-143. —————-, and S. Berry-Lowe, 2006. Differential xanthophyll cycling and photochemical activity in symbiotic dinoflagellates in multiple locations of three species of Caribbean corals. J. Exp. Mar. Biol. Ecol., 339: 86-95. Wicks, L., E. Sampayo, J. Gardner, and S. Davy, 2010. Local endemicity and high diversity characterize high-latitude coral-Symbiodinium partnerships. Coral Reefs, 29: 989-1003. ———–, R. Hill and S. Davy, 2010. The influence of irradiance on tolerance to high and low temperature stress exhibited by Symbiodinium in the coral Pocillopora damicornis from the high-latitude reef of Lord Howe Island. Limnol. Oceanogr., 55(6):2476-2486.